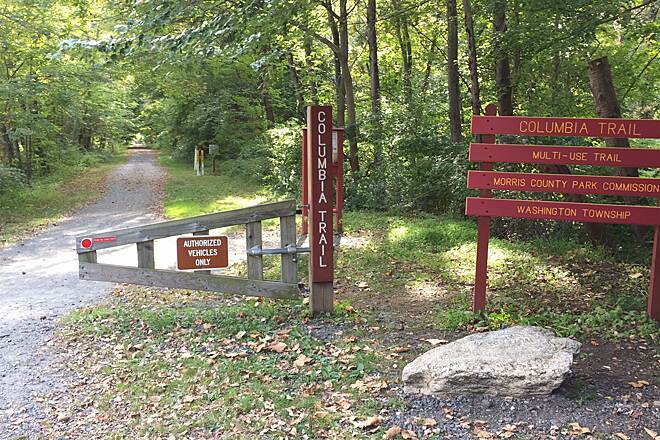 The Columbia Trail strings together forests, farms and parklands as it stretches 15 miles among the small towns of High Bridge, Califon, Long Valley and Washington. 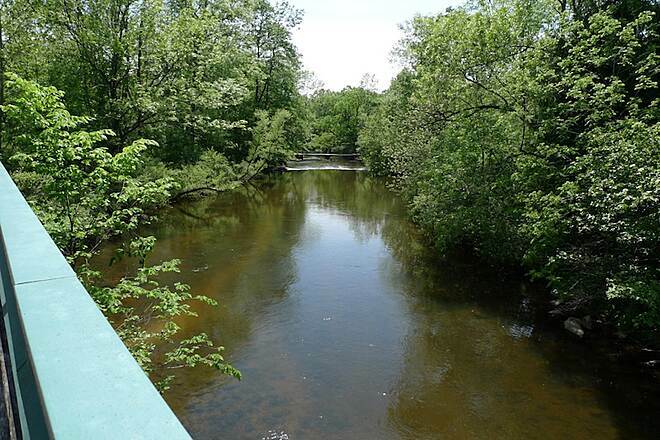 Most of the corridor parallels the South Branch of the Raritan River. After passenger trains and rail cars laden with iron ore ceased running this line, the Columbia Gas company constructed a pipeline under the former rail bed. 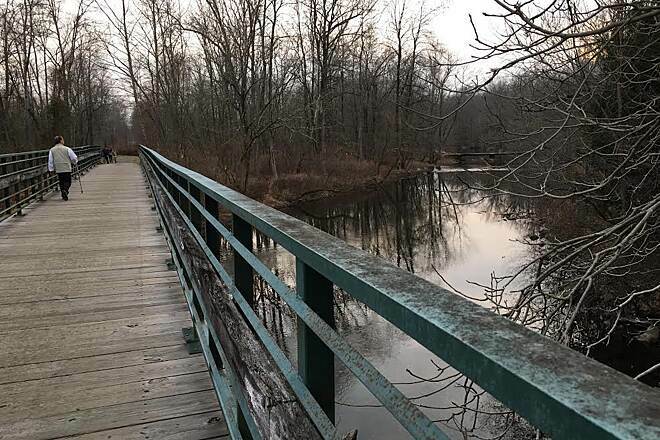 It then transferred the surface rights to the parks departments of Hunterdon and Morris counties for a recreational trail. The trail starts in High Bridge near the center of town. 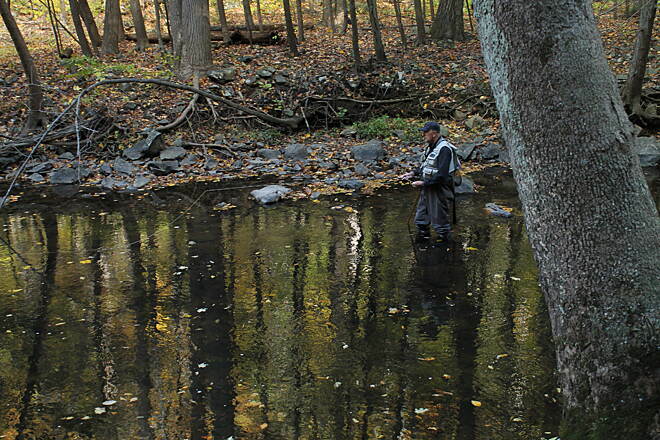 Several lightly traveled side streets intersect the corridor before you encounter woodlands and the banks of the Raritan River, considered one of the state's premier fly-fishing trout streams. 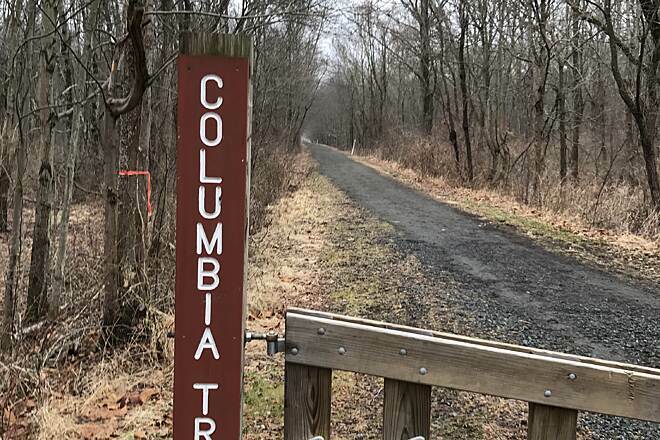 In approximately 0.25 mile from the starting point, the Taylor Steelworkers' Historical Greenway, a 6.25-mile hiking trail through historic sites, intersects the Columbia Trail on the right. After about 2 miles, the trail enters the magnificent Ken Lockwood Gorge, where steep slopes reveal rapid water and dramatic rock formations. 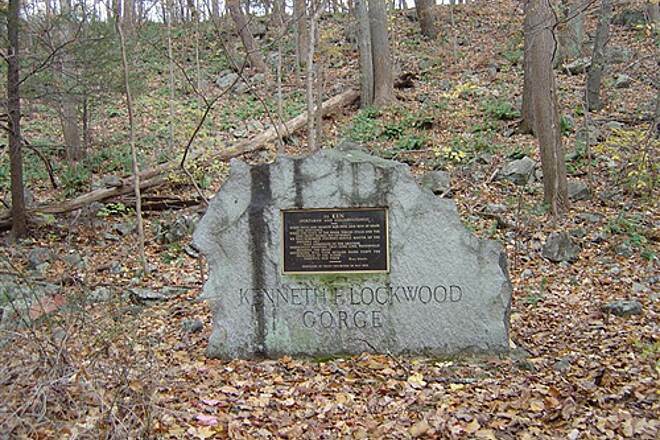 A naturalist's dream, the gorge is named for the late outdoor writer and conservationist. 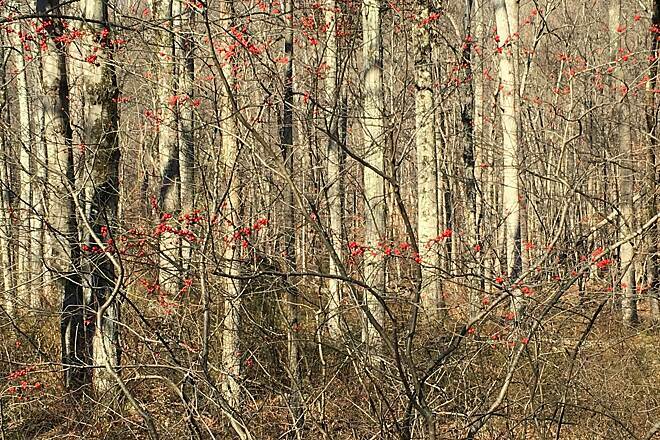 The surrounding hardwood forest makes for a particularly colorful autumn, and in spring wildflowers brighten the landscape. Black bears have been spotted in the area, though far less frequently than whitetailed deer, raccoons, coyotes, foxes, squirrels and chipmunks. 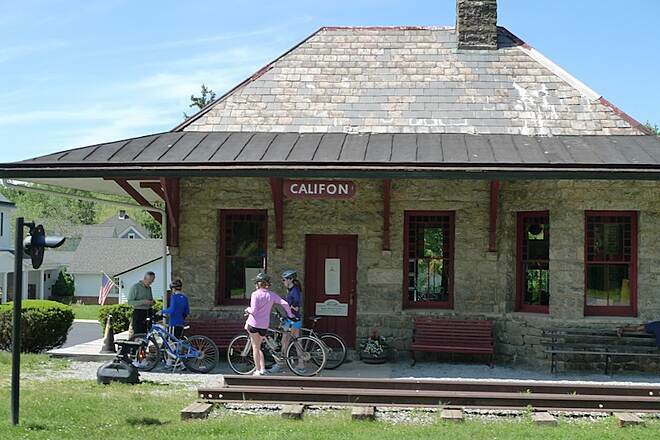 The tiny borough of Califon boasts 170 structures on the National Register of Historic Places, including the restored railroad station. 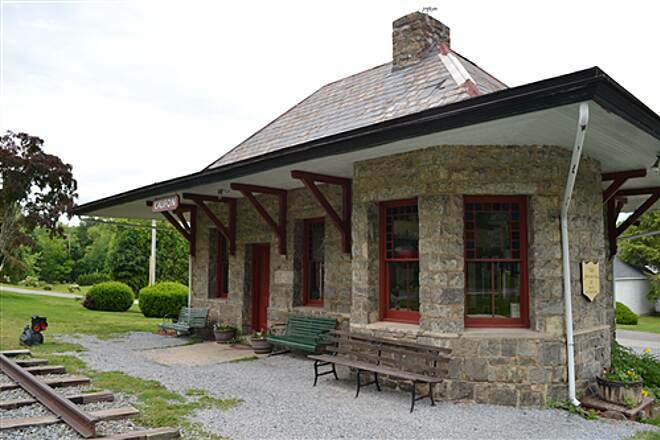 The station, built entirely of stone, houses the Califon Historical Society. The area mills gained prominence for furnishing central New Jersey's thriving agricultural industry with wooden slat baskets, commonly known as peach baskets. Homes in the Victorian village are marked with the date of construction and the names of the builder rather than street addresses. 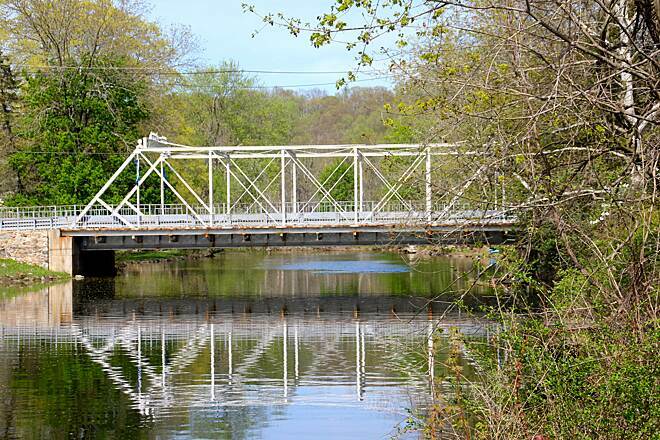 Local legend says the name Califon was a sign painter's invention. The town was originally called California but when the railroad station was built, the sign painter could not fit the name California on the board provided and abbreviated it. 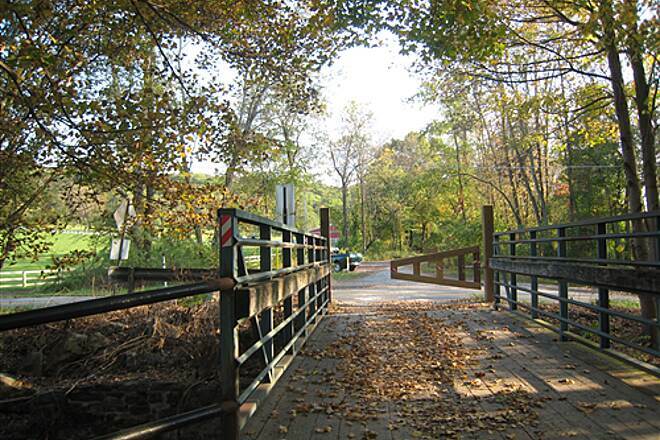 At West Valley Brook Road, the trail leaves Hunterdon County and enters Morris County. Very little, other than a change in the design of the trail access gates, changes though. 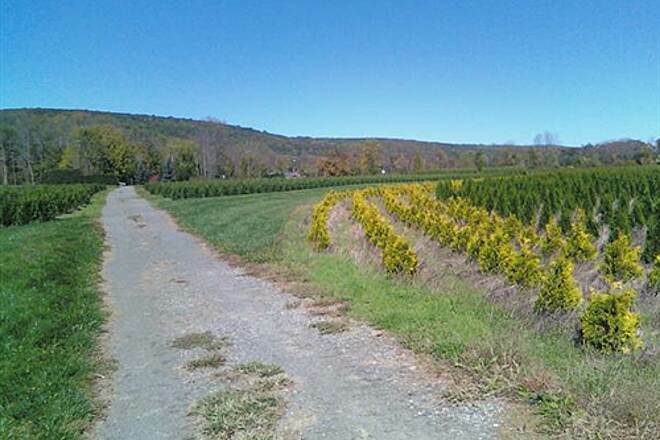 The landscape along this section into the Long Valley is more agricultural in nature. The trail ends at Bartley Road in Washington Township. To reach the west, or High Bridge, end of the trail from I-78, take the exit for State Route 31 North. Turn right on West Main Street. After crossing under the railroad tracks, turn left. Trailhead parking is on the left just past the borough hall. 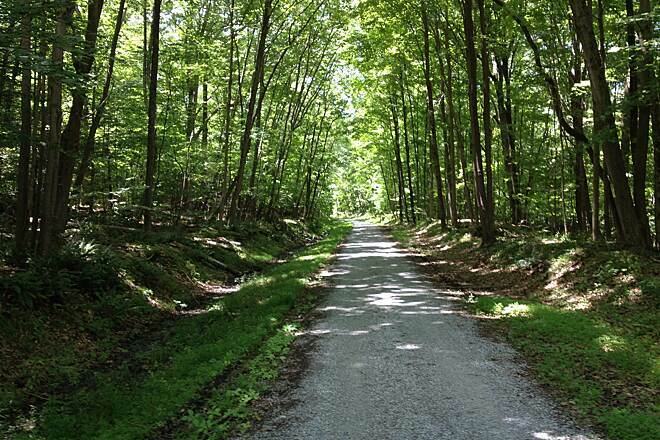 Parking is available at the east end of the trail at Bartley Road in Washington Township. Or, to reach the trail in Long Valley: from I-287, take the exit for US 206/202 North. Bear left to remain on US 206. Turn left onto SR 24. Follow SR 24 by turning right onto Schooleys Mountain Road. The trailhead parking lot is on your left. 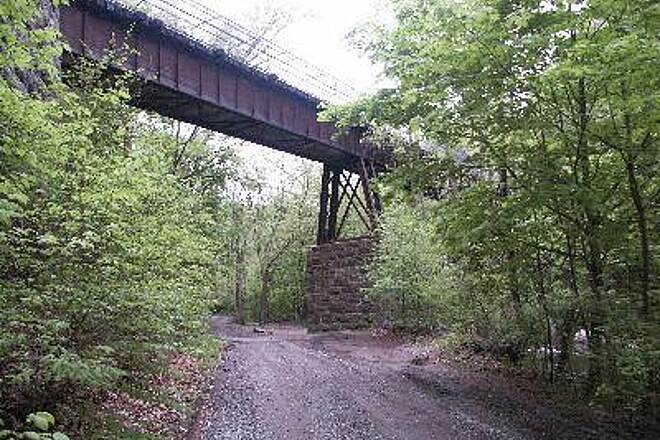 Those who want to start their trail experience by train, can take the Raritan Valley Line, a regional commuter route from Newark Penn Station to High Bridge. The train station is located at Central Avenue and Bridge Street, just a few blocks from the Columbia Trail's southern endpoint on Main Street. I call this the Snow White trail because it puts me to sleep. No incline, no gear shifts, no fun. It’s mostly covered by canopy so if you’re there in the summer you’d be better off loading up on bug spray rather than sunscreen. Great for runners, cyclists, equestrians, or a casual family walk. Someone stated this trail is inclined in both directions- this is untrue. It’s generally level and the elevation difference is minimal from end to end. Many places to park and hike in either direction as well as trailhead parking. Busy on weekends but nice to see people out loving the trail. The trail is generally 6+ feet wide. 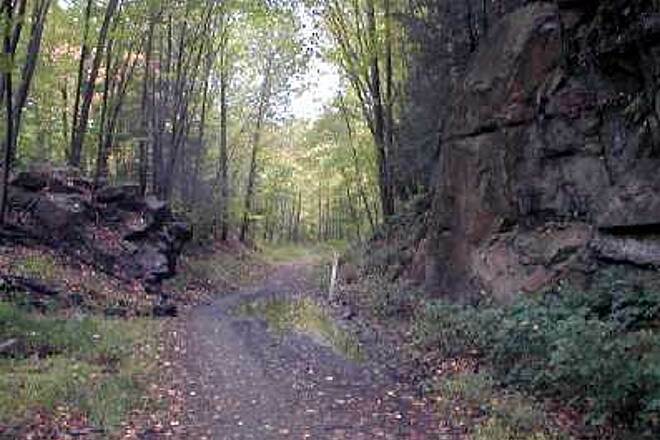 You can connect to Patriots Path, Gillette Trail, and others from this very popular trail. We started in High Bridge NJ..Trail has a slight incline in both directions,but nothing to speak of..At first you ride high above the river..nice views.Just watch where you're going you don't want to ride off the side.There is a lot to see,different scenery along the way,waterfalls ,woods,river,residential..bridges..We seen a few deer.Mostly shaded.most of trail is wide,as we kept riding further ,some parts were a little narrower.but not bad.It started getting little muddy,had been raining so we ended up turning around the 11th mile & rode back(22 miles total) We noticed that towards the end,the trail wasn't kept up as well & didn't see any mile markers. But still nice. Not really any bathrooms,probably can go into one of the towns. Was a porter potty in parking lot. Would like to go back & start in other direction. This is a beautiful trail. I always start at High Bridge and work my way towards Long Valley. There is a slight incline in this direction. It makes for a much easier ride coming back. 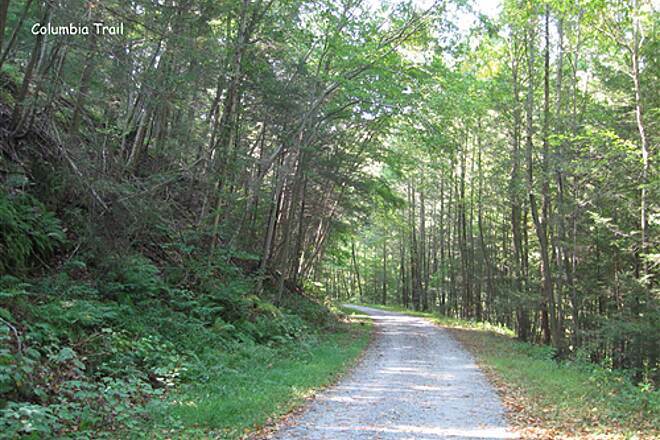 This trail is well maintained and easy to ride along the entire length. There are parking areas along the route so you don't have to ride the whole thing. It is very scenic and there are many photo ops. You will not be alone on the trail but it isn't over crowded either. I've seen all types of bikes on here; fat tires, road bikes, hybrids, MTBs. The trail is smooth enough that any will work fine. 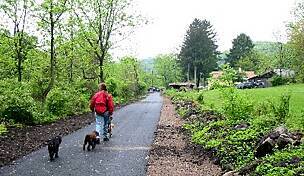 This trail is multi-use and there will be people walking and even some on horseback (past Califon). The trail is wide and is made of well packed gravel and dirt. It is well maintained and dry even after heavy rainfall in the past 2 - 3 days. Almost the entire trail is covered by canopy from surrounding trees and it is beautiful. Then entire trail is pretty much flat and easy. The entire trail from beginning to the end is 15 miles and it provide a mile markers. Highly recommended. As of 8/22/17 there is a trail closure approximately 3 miles north of High Bridge. No date is available for completion of the work. The good news is there is a very nice (unposted) detour that uses River Road. River Road is unpaved for much of the detour and not a through road for vehicles. 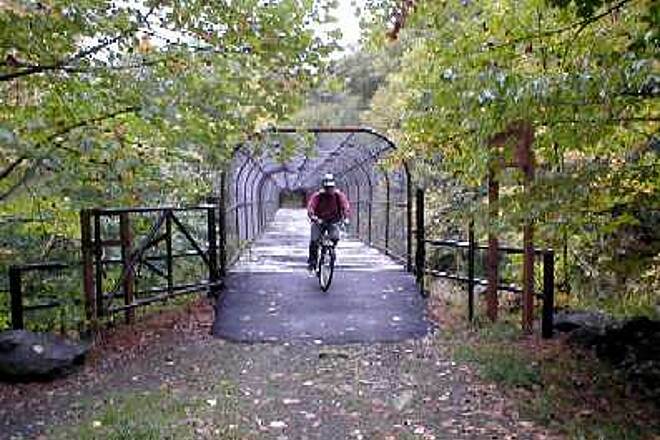 It's fine for a bike and runs right along the South Branch of the Raritan River while the Columbia rail trail runs above it. You can get a .pdf version of a map that shows the details at http://www.state.nj.us/transportation/commuter/bike/application3/pdf/ColumbiaTrail.pdf. Other than the closure, a great trail! It's a wonderful easy trail, that's well maintained. It starts at the free day parking lot. The trail surface is flat that's topped with a thin layer of crushed gravel. The trail stayed dry even a day after a heavy rain. Trees cover both sides of the trail providing plenty of shade. There are just a few open views where farms are visible and most of the views are of the river with occasional access points. I moved here because of the trail! Is This Really New Jersey? This has become one of my favorite trails to run in New Jersey. The trail is well-maintained, the crushed stone is dry (even after rain) and easy on the feet, there are mile posts every quarter mile, and the scenery is beautiful. There is a local coffeeshop in High Bridge and a great new coffeeshop (The Coffee Potter) on the trail in WShington Township. 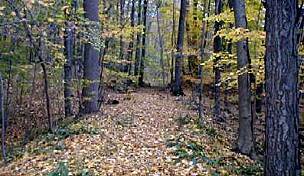 The trail is always in perfect condition, this sunday october 9 i will be hiking it to the Oktoberfest at Circa restaurant in High Bridge.Great stop after a fun hike or bike. I use this trail three or four times a week for cycling and running. It is well maintained gravel trail that's practically flat. It's multi use so watch out for other users. 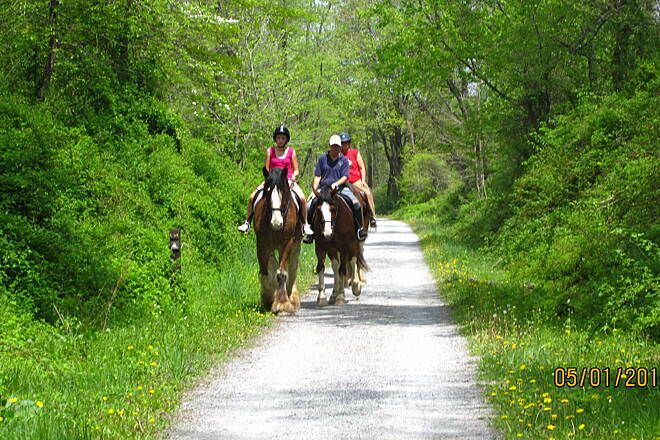 You will probably encounter horses so remember to give them right of way. I've seen ridiculous suggestions that people should pick up after them. There's even a sign. **** the country so please the drama. Also remember road bike tires won't hold up on a gravel path. Use a trail bike. If you don't have one the local bike shop in cLong Valley will rent you one. Enjoy! We came up from South Jersey to check out this trail. The trail head in High Bridge was easy to find and in a nice area, so I felt fine locking-up and leaving the car there. The whole trail overall was well shaded, good for our late-August trip in the heat. The surface of the trail was finely crushed gravel that was well compacted. About two miles in, rock outcrops started to line the sides of the path which made it feel very secluded. The trail also entered the Ken Lockwood Gorge, which was a spectacular sight and made the trip worth it- the trail was mid-way up the mountainside and overlooked the river below. If we had more time we would have joined the several swimmers observed bathing in the river below. Several bridge crossings, some big some small, added great vantage points to the trail as well. Our trip started in High Bridge and for our turn-around point we chose Long Valley, where a small detour led us to Long Valley Pub & Brewery for a mid-ride refreshment and snack on their outdoor patio. The ride back from Long Valley to High Bridge was downhill overall, which made the 12 miles back more enjoyable after our mid-ride refreshments. Overall, we traveled 12 of the 15 total miles of the trail, making for a 24 mile round trip. This trail has become one of my favorites in New Jersey. One of my favorites. Great scenery, not overcrowded, and perfect length. If unfamiliar, please read a previous review. The April 2016 review by jrutch is a very accurate description of the section just NE of Schooley's Mtn Road. We had printed it out beforehand and though the trail appears to end at a couple spots, we were able to find and complete the NE section of the trail giving us a 30 mile day. It's worth pointing out that the trail is roughly 75% shaded even at mid-day. This made it much more comfortable for our 82 degree July ride. Many thanks to jrutch for documenting that short, little trail interruption. You need GPS to find the parking lot. Started at North end at Bartley road. With the tall trees you are mostly in the shade. 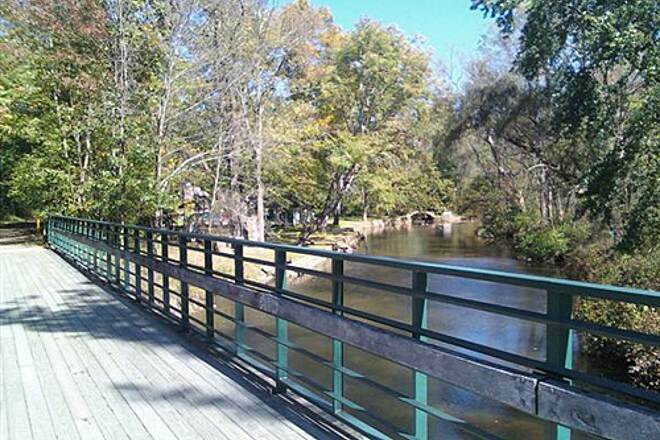 It is a scenic trail that parallels the river with picturesque bridges and convenient benches. You ride past horse farms and cattle pastures. I would definitely recommend it and plan to ride it again. I rode this trail for the first time this past weekend. 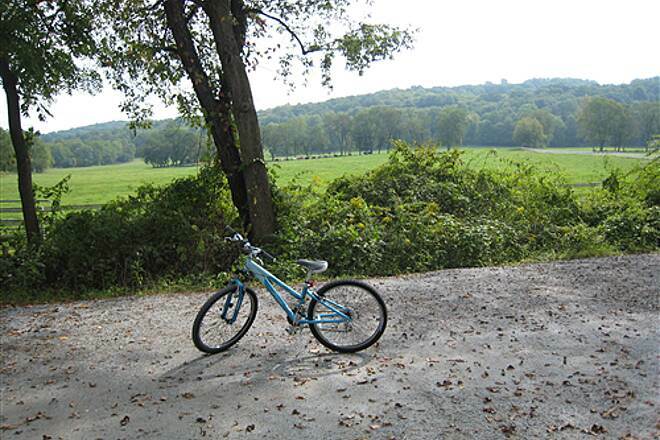 I started at Bartley Road in Washington Township and rode the entire trail to High Bridge and back - just over 30 miles. The trail is meticulously maintained with only one or two brief sections that are not super smooth. According to my GPS, there is 344 feet of vertical climb over the 30 miles making the ride essentially flat. That said, the trail gradually slopes down in this direction, with the majority of the decent occurring over the last three miles as you approach High Bridge. 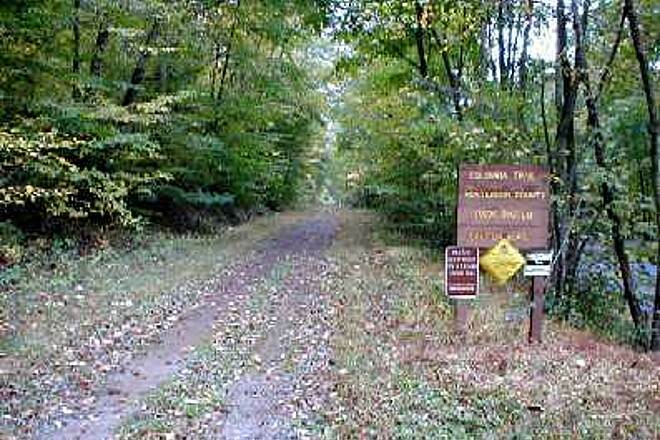 Of course, this means that the return back to Washington Township is mostly uphill, again with the steepest assent occurring in the first three miles of the return trip as you leave High Bridge. Even at its steepest point, the grade is no more than 1.5 degrees. I highly recommend this trail for anyone interested in hiking, running, or cycling. 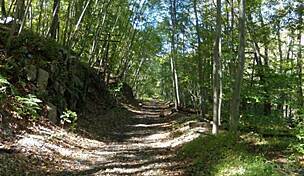 My family and I rode our bikes on this trail starting from the northern end at Bartley Road in Chester. About 3-1/2 miles into the trail, the path was interrupted by a company called Frazier Industrial and Toll Brothers Enclave at Long Valley. 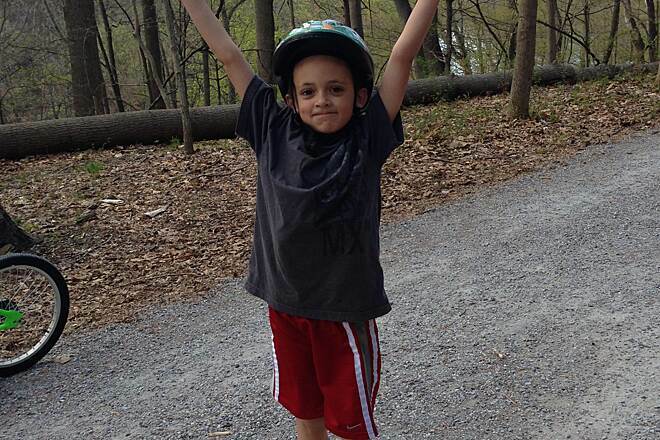 We had our son with us, so he had to walk his bike down the trail and back up as the trail was cut off. Just be aware of this interruption. But the trail itself is OK - just not a fan of the trail being interrupted. Did it. Liked it. Will do it again. I am proud to say that I am the very first person in the entire world to have ridden a recumbent fatrike the entire length if the Columbia trail!! My bike is a three wheel "Recumbent Tadpole Trike" that was designed as an off road "Fat Bike". I ride 4.8" Vee Snowshoe XL tires on all three wheels. What makes this particular trail perfect for recumbents of any kind with off road tires let alone my fat trike is that is is more or less dead flat. I have ridden every rail trail in NJ extensively on my BikeE FX full suspension two wheel recumbent and this is now my new fave! I also like the Sussex branch trail however it is interrupted by rt. 206 which makes it unsafe because you have to ride on 206 for a while. I have the 26" wheeled version of the Trident Terrain fatrike and my son has the 20" wheel version. The wo of us have been riding sections of this trail from Long Vallet to Califon regularly and love it. It is very well maintained and easy to follow. We did get a little. Iced up by the new townhouse development in Long valley but we figured it out pretty easily. 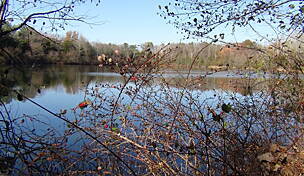 I go on the Columbia trail 3-4 times a week, its nice and quiet and gorgeous in the fall! Columbia is well-managed and very easy on the eyes. The gravely trail makes it a bit of a challenge for road bikes, but is by no means impossible! My boyfriend and I road the trail end to end, and while we got a major workout out of it, we have zero regrets. 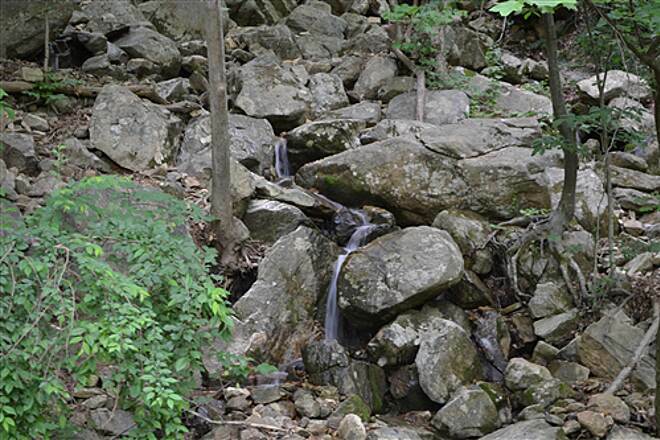 Despite the rocky portions of the trail, the cleanliness and consistency of the path itself made the ride a pleasant one, filled with deer, a waterfall, and gorgeous overlooks. There are plenty of resting spots, and the trail can be easily modified for those looking for a shorter jaunt. For the most part the trail is very clearly marked and milage is indicated in both directs. We rode this trail this weekend.Great trail for all ages. Dirt road and crushed stone trails lead you to historic sites. Very friendly atmosphere.30 miles round trip. Add history and a waterfall with a loop along the river! As you leave High Bridge heading east on the Columbia Trail towards Califon, Middle Valley, Long Valley and Bartley, at around .25 miles you may hear the sounds of a waterfall. It is a steep, risky scramble on foot through a fragile woods area down to the Lake Solitude spillway. There is a safer route by bicycle that avoids uphills and gives you a ride at river level through beautiful Ken Lockwood Gorge. From the High Bridge parking lot opposite the trailhead, exit the lot by turning right along Main St/Rt 513. Take your third left onto McDonald Street, downhill two blocks to a T at Mill Street/Washington Ave. Turn right onto Washington Ave, following it around to the left as it becomes River Road. In about a mile or so (sorry, I didn't mark exact mileage), on your left will be a parking lot for Solitude Museum House by Lake Solitude with a short, level walk and safe access to the spillway (dam or waterfall). Continue on River Road a mile or so to Cokesbury Road. Make a left onto Cokesbury and then a right to continue on (Raritan) River Road. Enjoy the up close and personal view through the Gorge along the river! Continue a couple more miles to Califon. 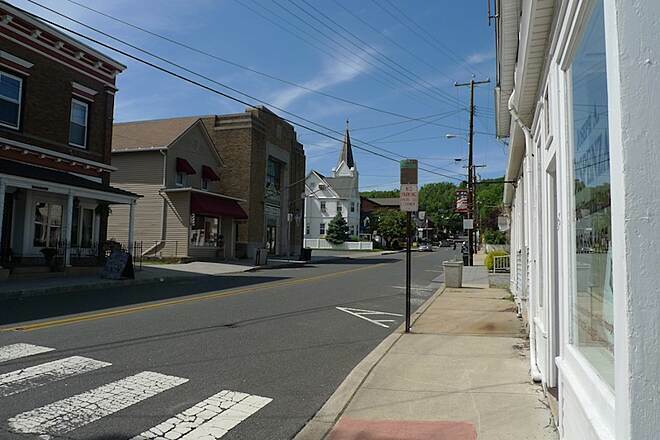 Turn right on Main Street, stay to the right and go about a block and turn right onto the Columbia Trail, past the historic Califon Railroad Station. Take the trail a couple miles over a restored bridge and stop and read the marker about the great train wreck of 1885. Continue a few miles more back to High Bridge and the end (or start) of the trial, back to the parking lot. 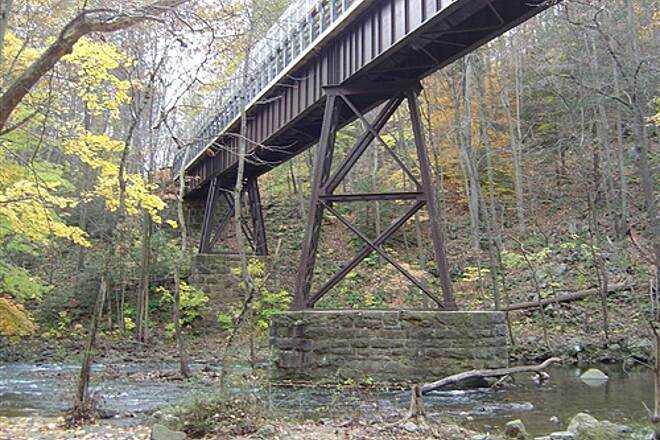 This week I ride Bartley to High Bridge and back, just over 30 miles of great riding. The detour around the Toll Brothers property in Long Valley could be in a little better shape and maybe a tad better marked, but the rest of this trail is a true gem! The surface is smooth, flat an wide - perfect for all skill levels. Enjoy! Keep your eyes open as you will see so many awesome wonders on this trail! I rode from Long Valley to High Bridge and back thru the gorge...it was absolutely stunning.... I highly recommend this trail. Can't wait to ride it again! 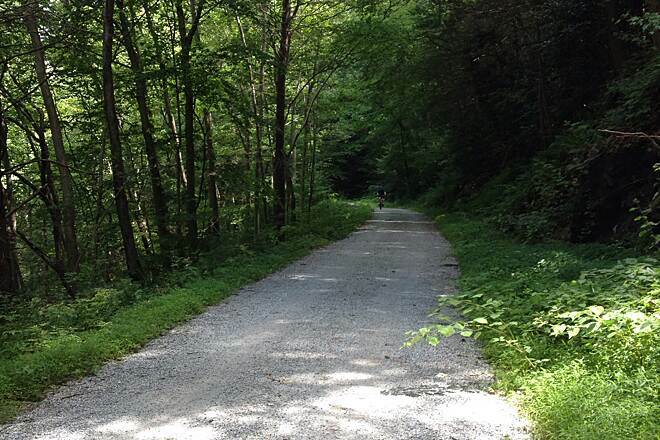 After experiencing biking on this trail, I felt compelled to write my review. This is a must do trail if you have not done it yet! I would highly recommend riding to the gorge. From the north trail head, anticipate about a 12 mile ride. 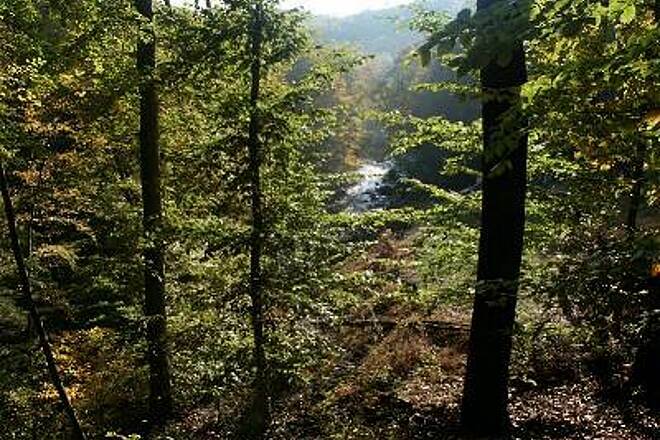 If you stay on the trail, you will see some awesome views of the river below. When you get to the bridge, you have the option to take a path that brings you to the lower part of the gorge. This path is right next to the river. Overall, I had a great experience on this trail and I would highly recommend it to anyone. Now I know why most people rated this trail five stars. I have not donated to Rails to Trails at this time, but after this experience, I most certainly will. Went there to experience the Taylor Steel Mill Greenway. I found this a bit disappointing. However, I also took my bike and did the Colombia Trail. I enjoyed this part of it. The ride went through a gorge, a tumbling stream below, farmland, and small villages. The trees were just beginning to leaf so the views were not obstructed and yet there was a touch of green. My only negatives were that there was too much gravel in a few places (instead of grit, ), several new houses beginning to show up adjacent to the trail, and the Toll Brothers area (Which I hear will be rectified in the near future). I hope the county/state makes an effort to preserve the adjacent woods and farmland so that future generations can continue to enjoy the rural heritage that accompanies this trail. It was a nice day and I'd highly recommend the trail to those who enjoy an active day outdoors. The detour near the Toll Brothers construction site is now open. There is about 50 feet of dirt trail that is not completed, but it goes through all the way. The trail can now be ridden from end to end without detours. This is my favorite local trail to ride on and I plan on riding it every weekend. Today I rode the trail starting at High Bridge and rode to the end and back. It's a great all round trail, reasonably flat and the surface was nice and compact. The views were magnificent looking down the adjacent gorges, which was helped by the lack of leaves on the trees at this time of year. The trail was very popular with plenty of other cyclists, walkers and runners, which was great for a solo rider like myself and pretty much everyone was friendly with a wave and 'hello' to see you on your way. All in all it made for a very pleasant and enjoyable ride. As noted in previous posts, the trail is blocked at the Toll Bros 'Enclave at Long Valley' but if you make a 0.7m detour by taking a left (if traveling from High Bridge) on Fairview Ave, for just over half a mile and then pick up the Gillette trail, on the right, for another 0.2m it brings you back in on the Columbia Trail allowing you to continue the full length of the trail. Obviously in reverse traveling in the opposite direction. 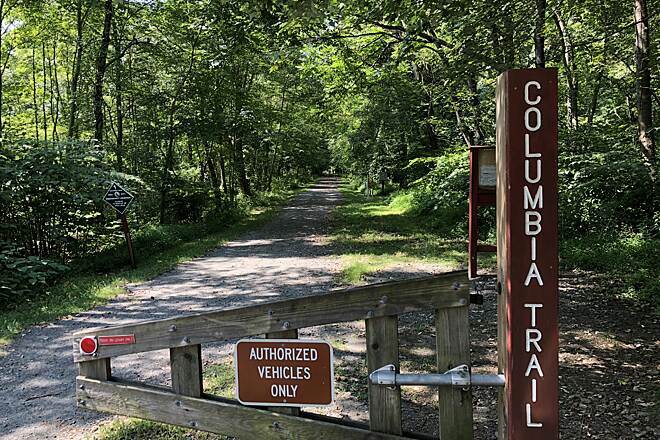 "The Columbia Trail is being re-routed because of the new development. The new fence was constructed to shield the new homes from the steel plant. The Columbia Trail was actually located on Toll Brothers property and needed to be re-routed. The park Commission met with Toll Brothers, DEP officials and Township of Washington reps. The MCPC needs to apply for a permit to locate the trail along the back of Toll Brothers property. We are not sure of the timetable but we think it will be accomplished very quickly. The Columbia trail is now closed at the Palmer Parking lot and at Schooley’s Mountain Road. Signs were placed there and I will go out today to make sure they are still up and if not I will replace them. We understand how popular this trail is and are working hard to get it opened as soon as possible." Started at High Bridge, decided to walk for my first visit. Very nice, we went off the trail to see the "waterfall". The trail was well maintained for the 3 miles that I walked. Can't wait to go back with my bike. Found a friendly cafe Harvest Cafe on Main St. It had good food and nice atmosphere. It was a nice way to end this beautiful day. My wife and I are beginner bikers riding hybrid Giant Roams. We started in High Point and did 9 miles out and 9 miles back in 2 hours of pure ridding time. Surface is level packed gravel/dirt with a slight down grade on the way back. The trail is very wide with two lanes established for traffic in each direction. 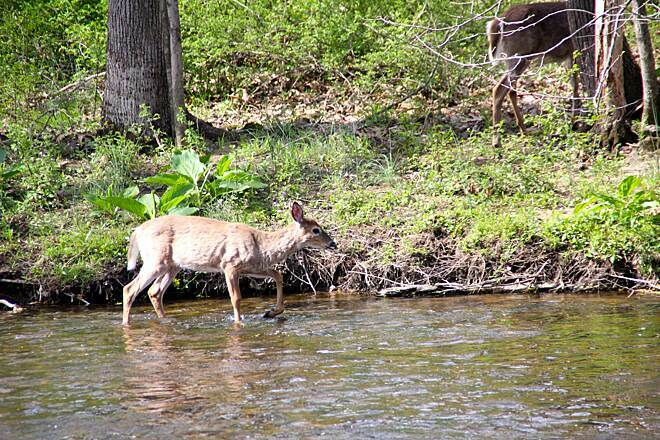 Decent scenery with the river, wild life, and local flare. Not overly crowded and the large width of the trail helped make passing easy. Safety markers every mile or so and very well marked with the exception of a small road stretch...just keep going straight. Found a cool country sandwich place in Califon up the cross road. Horse droppings were present but a non_issue. Lots of deer, some let us get extremely close. Fun run.... check it out. This is my current favorite trail. Yes, the presence of horses results in the presents of horses, but they are both easy enough to avoid. Today I rode the 15 miles up from High Bridge, but for a change of pace I detoured onto River Road in Califon on the return trip, riding right along the river all the way back. Of course since Escher didn't design the route there's a bit of a climb at the end. Next time maybe I'll park at Union Forge Park and try it in reverse. Today, 8/10/14, I just walked to the mile marker which is 7 miles in from Bartley road, the start of the trail. The trail has a nice packed surface for walking and a canopy of trees to keep the sun out. The fourteen mile round trip took me 4.5 hours. Not bad for a 59 year old. Next, I got to do the bottom 7.7 miles of the trail. Highly recommend this trail for walking, biking or horse back riding. Great ride. Mostly packed cinder with some gravel. A few minor washouts, nothing to worry about. A beautiful view for the entire way with 95% of the ride in the shade. I suggest starting from the southern trail head if you plan to ride a full circuit. The trail has a slight incline for most for the ride to the Northern trail head. Not bad at all but can be a bit tiring on the back half of the trip if you start form the Northern trail head. Great ride. Mostly packed cinder with some gravel. A few minor washouts, nothing to worry about. A beautiful view for the entire way with 95% of the ride in the shade. I suggest starting from the southern trail head if you plan to ride a full circuit. The trail has a slight incline for most for the ride to the Northern trail head. Shady trail for walking, but watch for the horse poop! 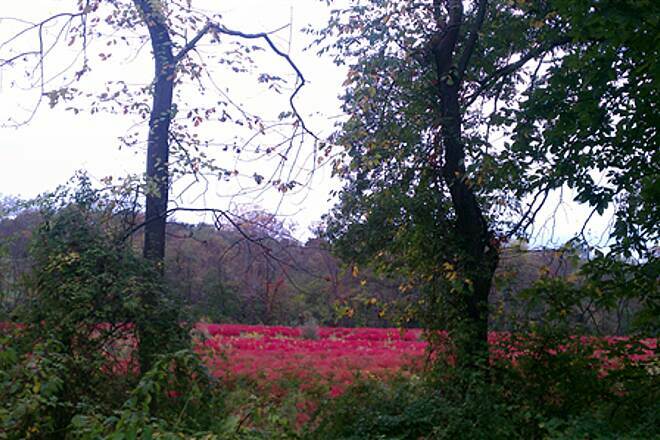 Two friends and I walked about six miles of this trail, on a week day, starting at Vernoy Rd, Califon. The parking was really hard to find, needs more signage. We would up parking at a park with a baseball field and had to ask directions for how to pick up the trail. It was a very hot day, high 90 degrees, but it didn't feel too awful because there is so much tree shade cover. We had a quiet and peaceful walk along the trail, but were slightly disappointed by its lack of colorful scenery. But we imagine it'd be more beautiful on the autumn months. We passed many more cyclists than walkers, so keep an ear out for bikes coming up behind you if you are walking it. The path is easy to walk in decent shoes, mostly gravel, some dirt areas. Overall, a good place to get away from the rat race and get back to nature. That said, the people who care for the trail (if there are even people who do) really, really need to clean up the horse droppings. It made for an unpleasant experience in places, dodging many plops along the way. It wouldn't take someone more than a week to clean up every last bit of it, using a golf cart and a scooper. Please, someone do something about that! This is a great trail with many different types of scenery: horse farms, waterfalls, industry, quaint towns, you name it. I started at the easternmost part of the trail at Bartley Rd. in Chester. The directions from the RTC website are spot-on. There isn't a lot of parking here but there are several other lots not far from the start. Most of the surface is crushed stone. There are a few spots with loose gravel so beware. There are a couple of small hills but it is mostly flat. I rode on a breezy, sunny day and there were not a lot of people. There was actually a charity ride happening but yet the trail wasn't crowded. There is a waterfall at Union Forge. I was unable to find a good vantage point. The lookout is shrouded by trees. If you take the Steelworkers Trail, it takes you to the remnants of an iron works factory. At one point, I thought the trail ended but it seemed too short. You'll know you reached this spot when you see an abandoned beige stone structure. If you reach this spot, keep going along the dirt path straight in front of you to where the trail picks up. 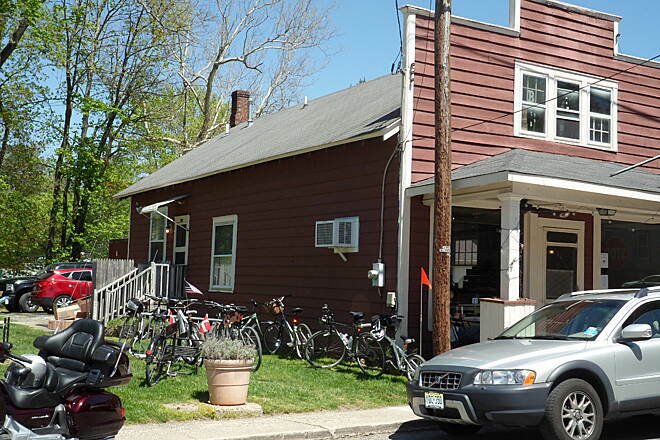 There is a bike shop called Cycle Craft in Long Valley. It is about 2 minutes from the trail. If you are going east to west, take a left on Schooleys Mountain Rd., then a right on West Mill Rd. The shop is on the right. They were able to help me out right away. There are also restaurants and a large trail parking lot at this site. I have probably been to this trail a million times by now-- and I only discovered it a few years ago. It is a fantastic, peaceful, beautiful trail with different scenery throughout to keep the ride interesting. I have gone here alone and with family and friends-- always a fun time. It's a very great trail. We drive about a half hour to access this trail. Highbridge to Washington use to be our favorite, but we are disappointed in the choice of stone they made in Hunderton county ,east of Califon, particularly. 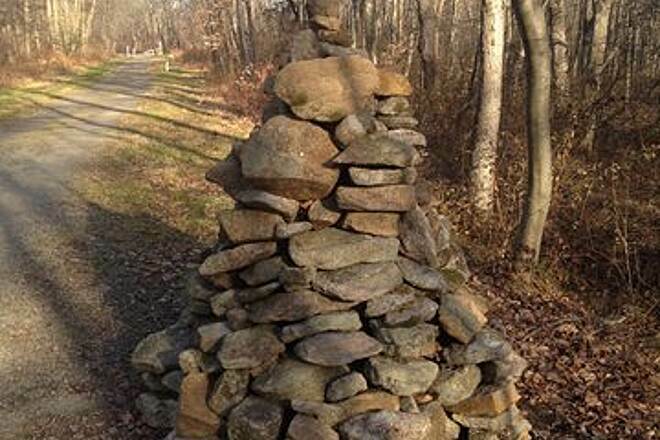 Much of the trail was resurfaced in Spring 2013, and the light colored soft stone used is deep and soft, like sand, worse in some places than others, and breaking down worse in some places than others, such as between Califon and Washington(border with Morris Cty). 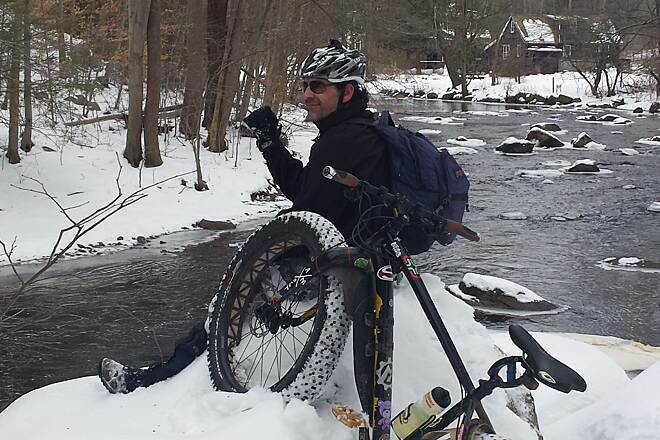 We take to the road in Califon when coming from Highbridge, and ride along the river to avoid the bumps and ruts that render our arms and hands numb in the 1.5 mile stretch. (We don't really mind the horse poop,and enjoy seeing the horses, but they really are adversely affecting the trail bed). This trail is great otherwise- gorge views, shade, and few road crossings. Slight grade going east makes coming back to Highbridge a faster ride-total is a little over 7 miles. We now prefer the next 8 miles from Morris County border to Bartley Rd. trail head. Still mostly the old-style hard dark grey cinder bed (even in places where recently refurbished)and the horses don't seem to ruin this surface at all(still some poop- welcome to the country! )Different scenery, woods and farms and rivers(no gorge) . A new little section just east of Schooleys Mt Road (parking lot, bank) does have some sharp (blind)turns and a steel bridge where tires may get stuck-no big deal, but opposing traffic/pedestrians are there-we've seen a few near misses and wipeouts. This section has a few park benches near the river, and a few pretty bridges-trail to bridge transitions seem to be an ongoing issues due to shift- we've seen cones/safety tape, but just be careful, as we rode it weekly, and the transitions were fine sometimes, but really bad others(bring a spare tire & pump!) Sometimes kids are selling lemonaid at Schooley's mountain lot for Alex's Lemonaid- bring a few bucks just in case. Description on web site, as mentioned by others, needs to reflect that trail does continue past Schooley's Mt. road now for several more very nice miles. 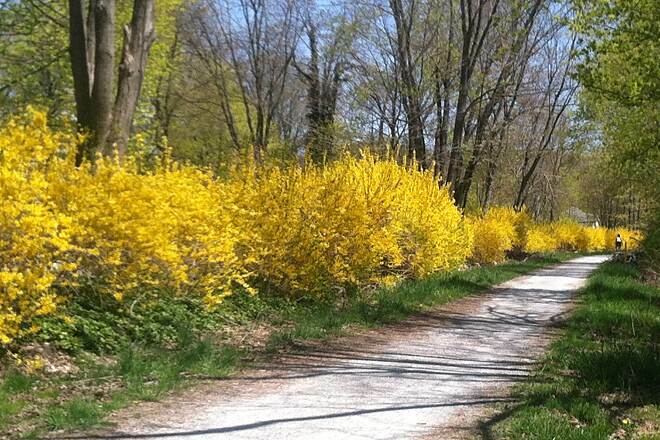 We love this trail, and make a point to visit each weekend during the warm months. Hoping the winter might pack down the loose surface so we can enjoy the Hunderton Cty. stretch as much as we use to! If you don't count damaged surface for ~ 1 mile long by horses - everything else is just perfect. One of my favorites in the state! Excellent day trail with some excellent scenery. It starts out going through the back end of High Bridge, through Ken Lockwood Gorge, up through Califon and Long Valley, and ending at Bartley Rd, right at the border with Mount Olive. If you cross Bartley Rd you can also see the beginning of the active portion of the rail line. The trail also parallels the South Branch of the Raritan River a lot of the way, which is kind of neat because you start out seeing it as a sizable river flowing through the gorge to it being almost a small creek at the northern end. If you're going to bike the whole thing, my recommendation would be to start in High Bridge and go north, as it felt like the entire trail is almost entirely (albeit slightly) uphill going northward, and there is a lot more parking on the High Bridge end too, as there's a decent sized free municipal lot just across East Main St from the trail head. Keep in mind this is also used pretty frequently as a bridle trail in spots, especially near one of the crossings of 513 south of Long Valley. The path is a churned up from the hooves for a little bit, but, it really isn't that bad as long as you keep an eye out for horse presents too ;). As a previous reviewer mentioned, yes, there is also a part where the cinders felt loose, especially when the trail goes through a park just after crossing 517/Rte 24, which was a little unnerving. But, overall, these minor quirks pale in comparison to the great scenery and great experience of taking this trail. The 'Getting-to-the-Trail', is a long drive for me, as i live on the East Coast of NJ, but worth it. 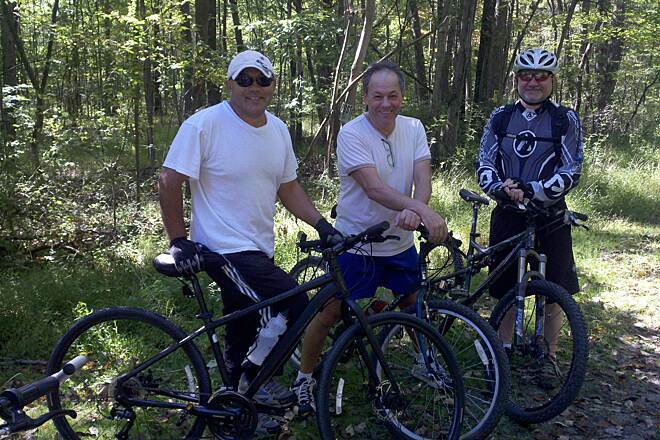 I've ridden the trail several times, since i have friends living in Califon, it's a 'mixed-reason' to go there. (They can usually be counted on for a meal if i stop by late in the day) I find the trail beautiful in all seasons, and the HighBridge end ( i start at the Train Station Museum in Califon)is enjoyable for 'touring the town', and seeing if i can actually make it 'back up' some of the steep streets. ( that was once a problem the steepness of some streets caused me to wimp out when i was 53, but now at 56, & 20# lighter, i'm able to climb better) The trip is also more 'scenic fun' in the later Fall; as the trees are usually bare and you can see the water & rocks more clearly. I have ridden this trail many times at all times of year and have always enjoyed this absolutely lovely trail. Unfortunately, east of Califon horses (Clydesdales no less! 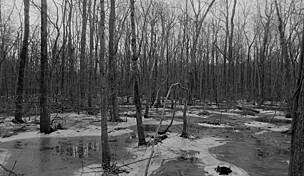 )have been using the trail to such an extent that the trail has been definitely altered. The hooves have dug up the surface and abundant horse manure is not easily dodged. The three horses riding side-by-side when I last rode there were very intimidating and only reluctantly moved aside as I came up. The use of this trail by equestrians should be banned. I won't be back until I know that horses are no longer allowed on this trail. So scenic! There are so many different things to see, it is definitely a fun and interesting ride. We have been there a handful of times a few years ago. I hurt my back 2 years ago and haven't been able to bike for long periods but once I have my surgery you better believe I will be out there next spring! My husband brings this trail up all the time so I know he can't wait to get back there too. Even though most of it is shady, we like going there on a day that is on the cooler side because it is a trip to the end and back. There are geocaching spots along the way where it is more residential and we have past a few families with small children biking those areas. I'm sure you could always break it up into smaller sections because there are a few streets you cross along the way if you can't do it all in one trip. I recommend doing the entire trail however you can because there isn't one part of it you would want to miss. Rode the trail today. It is pleasantly verdant and was surprisingly not crowded at all considering the mixed use and the gorgeous early fall-like weather. 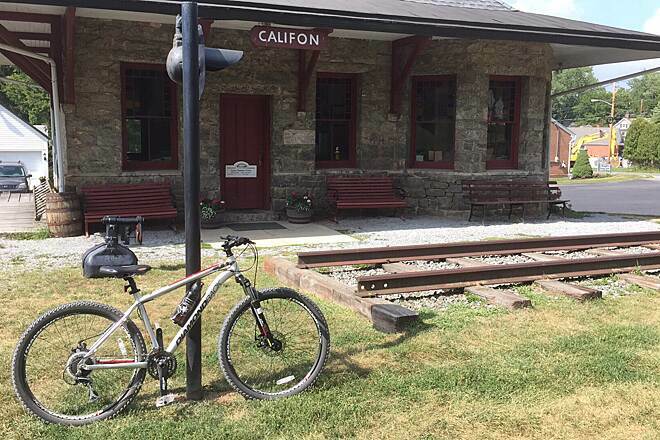 About 4 miles from the trail head in High Bridge you come to the charming town of Califon. Take a few minutes to explore. Especially don't miss Rambo's Country Store a true period piece (circa 1940) with its wooden plank floor and antique cash register. The trail was a full 13 miles. The additional 2 miles beyond Long Valley (mentioned in the website as being expected) have definitely been added. The northern end of the trail is now at Bartley Road. Beautiful trip today from High Bridge to Califon and beyond. A lot of shade. Slight up hill grade going this way. Great views. Nice parking area with porta-potty in High Bridge. Little places to get something to eat in both towns. Freshly graveled too. Unluckily after about mile 6 the horse poop becomes prolific (how about carrying a shovel folks?) and then the path becomes very bumpy from the horses' hooves pock marking the trail. Sadly we turned around but you can continue on the local roads in either direction and still enjoy the locale. We have completed this trail in the past and truly love it. 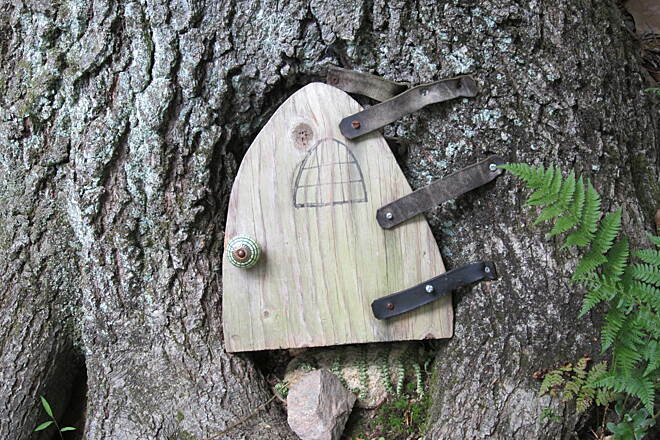 The gnome houses make this a fun family adventure. Addendum to 7 -30-13 trail comments by yours truly. 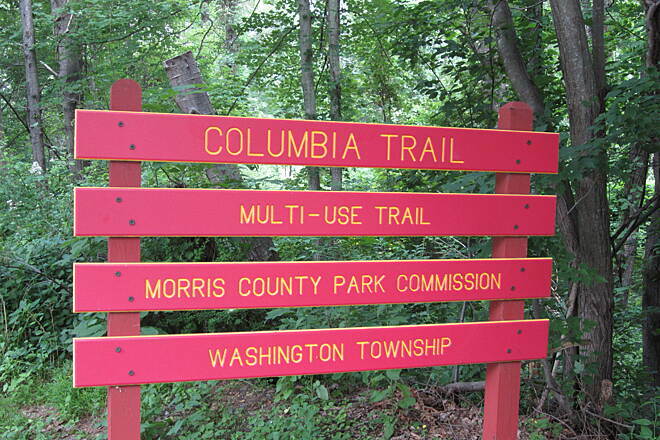 I should have noted that the Columbia trail from Long Valley New Jersey both to the north for 4 miles, where it is then labeled the Gillette Trail and the 11.4 miles from Long Valley to High Bridge is fairy well-shaded and thus a bit more inviting on those humidity-filled days. 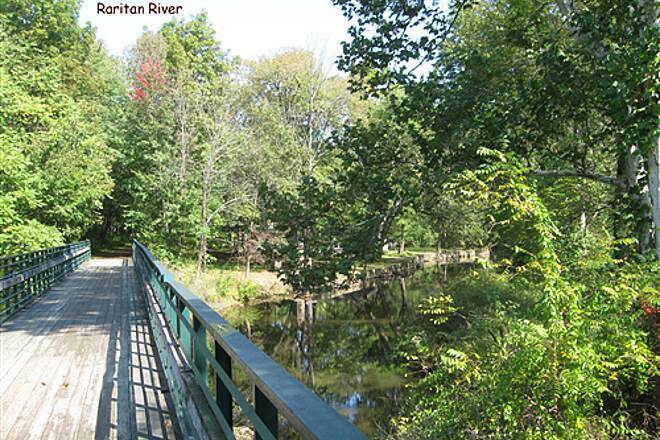 And It's also a good idea to dismount a take a good look @ the Raritan's South Branch. Recent ( 7-30-13 ) Columbia Trail review. 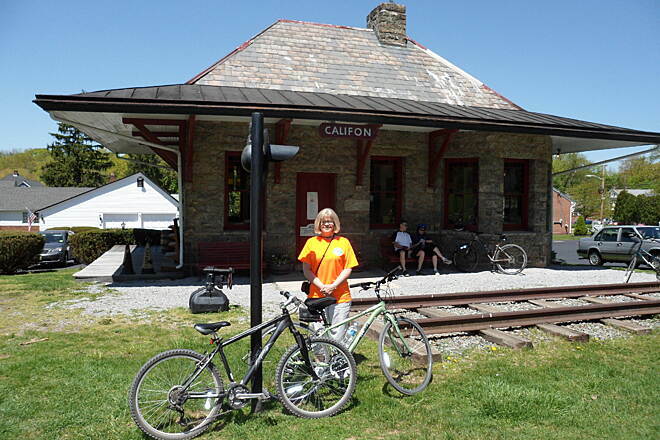 ON 7-30-13 with the sun shining,about 80 degrees, had a wonderful ride from Long Valley to High Bridge and back. Other than avoiding the horses' droppings, the trail in the latter southern stage became more scenic as I passed over the south branch of the Raritan River several times. Heading back northeasterly toward Long Valley, the trail became rutted a bit from the horses that are on this trail and the ride was somewhat bumpy for a mile or two. My Raleigh flatbar hybrid was more than adequate to negotiate this path. 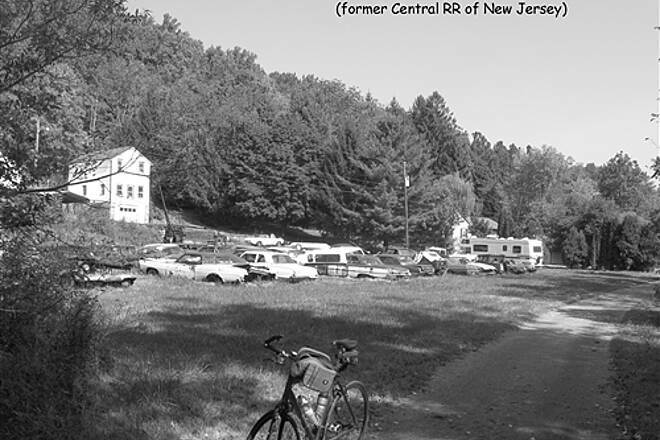 Additionally, the trial DOES continue for another FOUR miles past Long Valley, as the existing review already stated and I passed several horse farms riding over newly constructed small bridges over the Raritan, encountering several quite sharp turns on which it's a good idea to go quite slow. Sometimes the turns are severe. On the whole, an enjoyably scenic , rather hill-free ride. I am fortunate to live in Long Valley on Fairview right near where the parking access where Gillette Trail/Patriots Path is. I grew up in LV and used to ride this trail with my friends growing up. Now that I am older, my wife and I decided to take a ride and re-discover this hidden gem. First off, the trail is longer than the 11.3 miles it states. The end isn't Schooley's Mtn Road, it is Bartley road right where Flanders/Chester sort of connect. 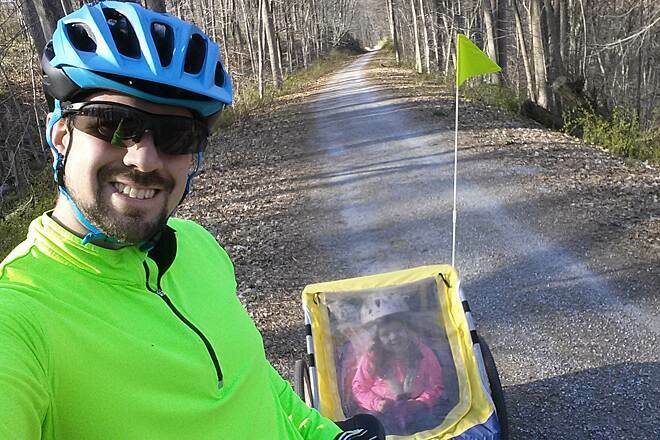 Either way, yesterday (Sunday) it was a gorgeous day and my wife and I hopped on our bikes and hit the trail. Like many reviews said, there aren't many places in this area where you can ride for this long without hills. We didn't do the whole trail, we stopped in Califon and were hoping to grab some light food/beverage at Rabmo's (general store type) but were bummed it is closed on Sundays. There is another little brunch spot called BEX I believe that was open, that was okay. The trail does have some horse droppings here and there, and we passed a small group riding Clydesdales (there is a farm right where you cross Rt. 513 where they are kept. Beautiful horses. I was very impressed with the upkeep of the trail, especially after Sandy took its toll on the area just a few months ago. No overgrowth, I loved stopping and catching a glimpse of some of the wildlife that was abundant in the area. Little ponds with turtles/frogs, birds, trickling creeks flowing to the river which is almost always in sight; it is beautiful. We plan on making the whole trip to High Bridge in the near future, I have done it once a long time ago, and that is where you see most of the pretty sights from the railroad's past. Everyone is very friendly on the trail. 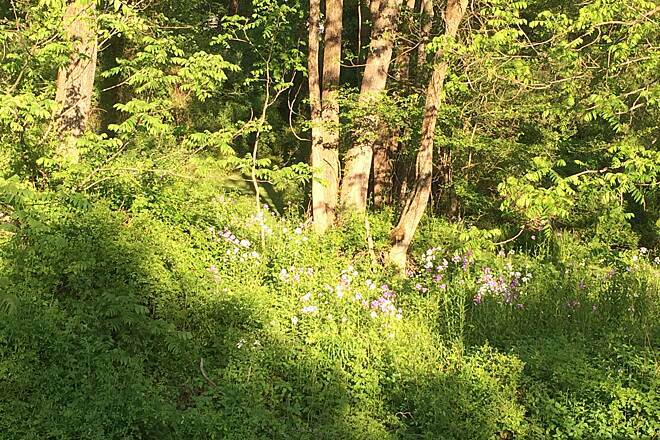 Beautiful trail - this is a wonderful resource easily accessible from most of urban NJ. We rode it end-to-end and back - 30 miles - on a hot day and it was delightful. The southern end has beautiful scenery especially through the gorge. Califon is a delightful little village - we stopped for a drink at Rambo's, just off the trail, and enjoyed sitting on the front porch watching the town go by. From there north the trail is mostly in the woods, although it occasionally passes residential and agricultural areas. For the most part the trail surface is smooth and easy to ride with our hybrid bikes. They were actually doing some trail repair in the Ken Lockwood Gorge section so I could see how the trail is made. Unfortunately, in the northern half, trail repair seems to be done by throwing gravel out rather than rebuilding the crushed stone surface and there are patches that are rough, albeit still rideable. There is also one section, just north of the Long Valley parking area, where the surface hasn't been packed down well and it's soft. I took a spill there on a curve when the trail grabbed my tire. It's true that there are some piles of horse droppings on the trail. This really was only noticeable for a few hundred yards near a couple horse stables. It did not interfere with our enjoyment of this beautiful trail. We will definitely be out to ride this one again. There aren't that many places in rural NJ you can get in a 30 mile ride without hills. My wife and I have been riding this trail on our mountain bike tandem for well over 10 years, long before the bridges were completed and the trail lengthened to it's present 15+ miles. Have we ever has a flat? Sure, twice, but that's why we carry spare tubes, a pump etc. The last reviewer talks about sport bikes, city bikes, rough tires, animal droppings and brown water! 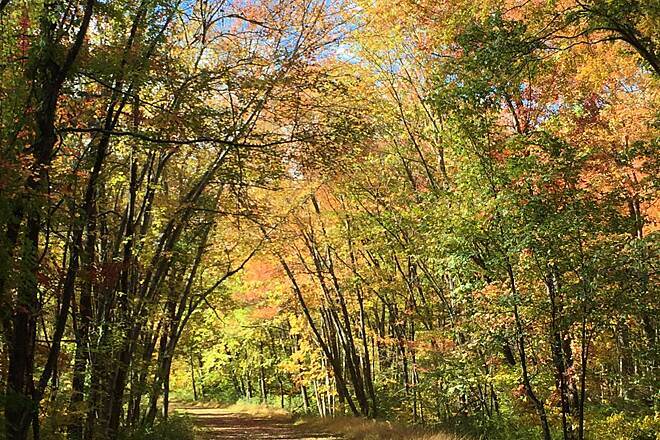 Don't let this review prevent you from riding this wonderful and pretty trail. The reason the parking lots were full of cars and visitors is proof enough that a response is necessary to correct false statements about this trail!! 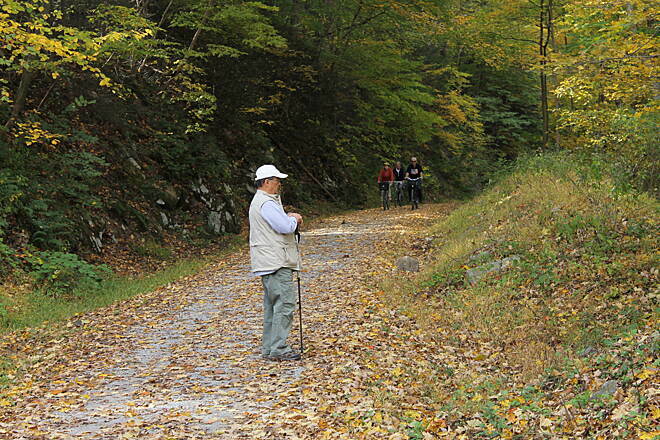 The Pa. tandem team, combined age of 131 years, recommends this trail. I decided to ride this trail today because reviews on this site suggested nice scenery. There are two key takeaways that I'd like to share. First: the trail surface is very rough. Both my wife and I ride city bikes, and my wife ended up with a flat tire (fortunately it happened on our way back near the trail head). We rode unpaved trails in the past, but this one was the roughest we encountered. 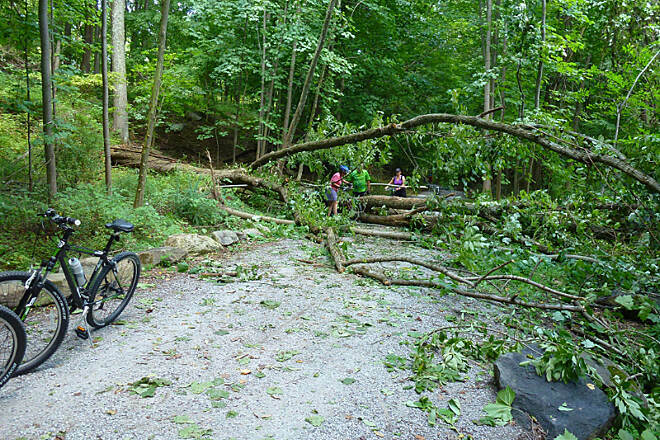 We saw plenty of people riding sports bikes and other bikes that didn't look like tough mountain bikes, but I wouldn't recommend it: we certainly won't attempt it again. Second takeaway is that the trail has so much droppings of animal feces that it reeks throughout the entire ride! 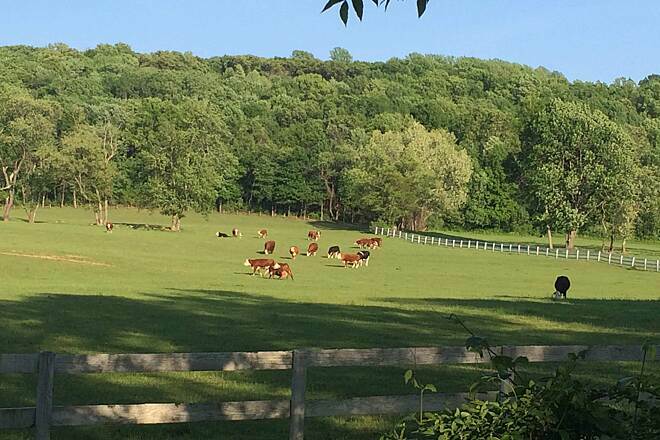 I am not sure whether I agree that the scenery makes it worth riding, because to me this is typical mid-western New Jersey scenery. 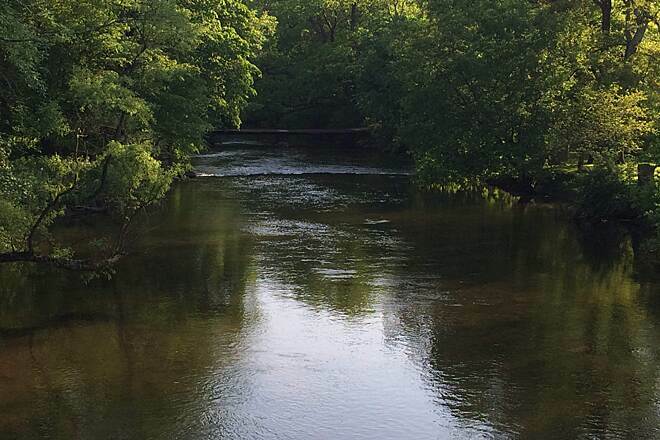 You ride through woods, wild fields, residential areas; you get to see the river, which has unsightly brown water. 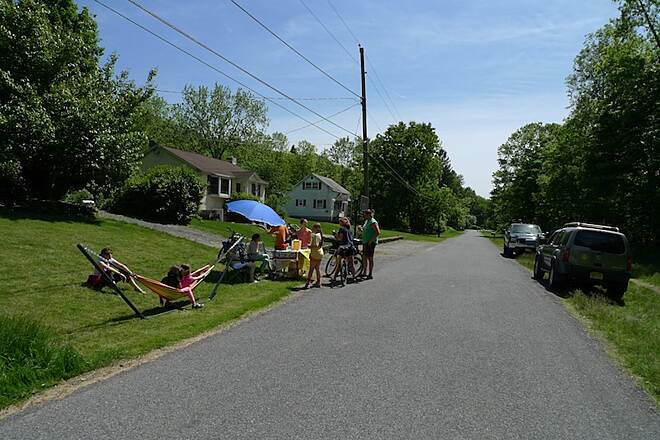 Some of the riders seemed to enjoy stopping on bridges or in Califon. 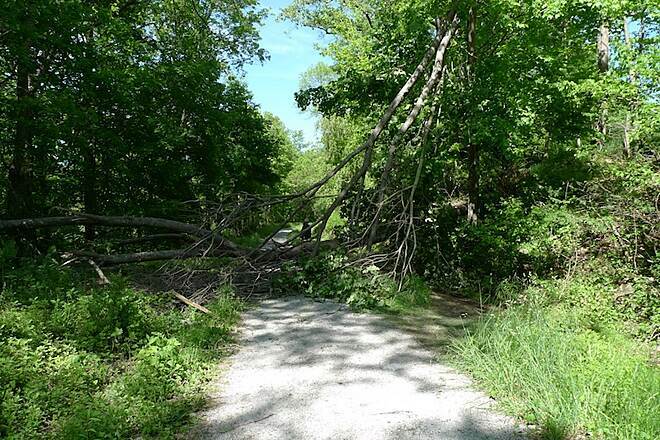 The only other thing I would remark on is that there are two large trees that block the trail and require dragging your bike through. With regards to parking: the lot across Main Street from the trail head was completely full when we got there. However there is another parking lot: it's located on Main Street and Mc Donald Street: there is a sign on the building pointing toward it. As other reviews noted: there are a couple of Porta-Johns on the lot across Main Street but no other restrooms along the trail. 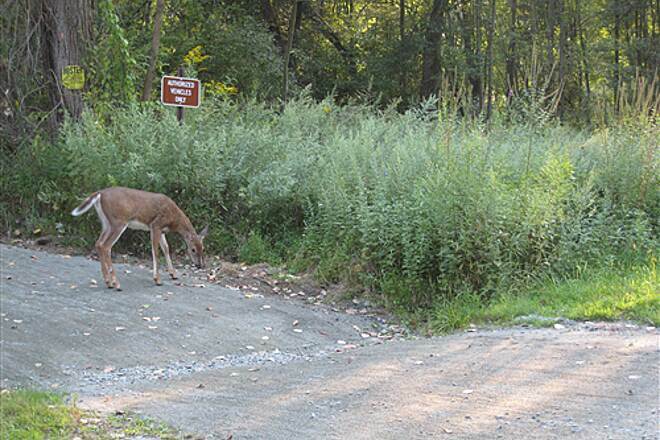 There is also a restroom in Voorhees State Park, which is a couple of miles away and there is no fee to drive into that park. I think the best thing about this trail is its length. Paved trails in New Jersey that I frequent might be 5 to 7 miles in one direction, which is not quite enough for me. If you do have a bike with tough tires that can handle all the rough stones and you don't mind rolling around piles of dung then this trail might give you just the right amount of exercise for the day. Fortunate to have this trail so close by to our house. 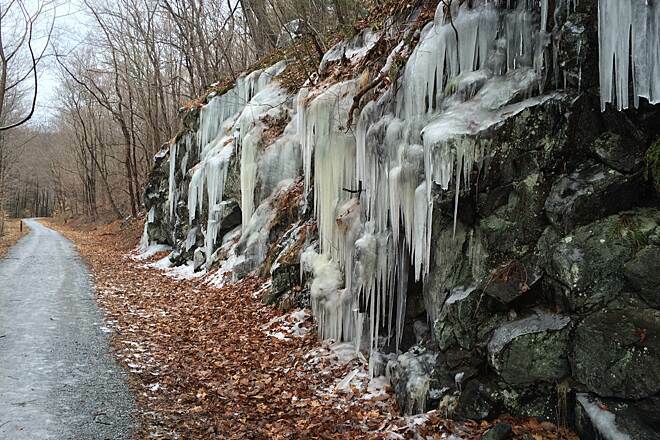 My wife and I enjoyed the trail from Long Valley to Califon and back on "opening day" March 30th. Had a great lunch in Califon before returning to our car. The trail is in great shape considering the storms that hit the area last fall. There were over 100 trees cleared from the trail. This trail comes highly recommended. This past Sunday we did the section from High Bridge to Califon and back and this section is also ready to go for 2013. I find this trail a friendly and calm trail. It also has some nice views of behind Long Valley that you wont see from riding on the main roads. 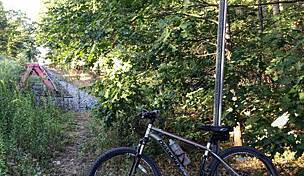 I did this trail 10/16/12 and had a great ride on a great trail on a great fall day. I was on my very old Mt Bike with a town and country tire and it work great for me. I did it from Long Valley down to High Bridge and back. The southern seven miles are the best as the surface is better and the scenery is also better. This is a family friendly trail as it is flat, with not too many Road Crossings and it has a great canopy. There where two high lights for me the old stone RR Station at Califon and Georges Bridge over Lockwood Gorge. There are Mile Markers every 1/4 of a mile but it are split up into the southern end of one though seven and then the Northern end one to three and a half. There are a few park benches and a few historical markers along the way. I just want to thank Columbia Gas for letting this trail happen. Very nice smooth ride. Beautiful scenic views. Rode from Long Valley to High Bridge and back. Seemed tougher on the ride back, but was worth it. Can't wait to do it again. Very nice short trail. Any trail one can ride in less than two hours not a long trail. I rode this trail on Sept. 5th. It was threatening rain and I barely made it before it came a downpour. There were a number of people going up half way and returning. The trail surface was in good shape even though it had been raining for awhile. I did not realize that High Bridge is the end of the line for one of the NJ Transit lines into New York City. Wish I had a tougher bike to tackle this trail again, but a road bike with thick treads might be sufficient enough. My tires were stronger than the default ones, but some larger rocks at certain sections worried me greatly. I saw quite a few people changing tires, and I was praying that I would not be one of them since I had forgotten my pump at home. 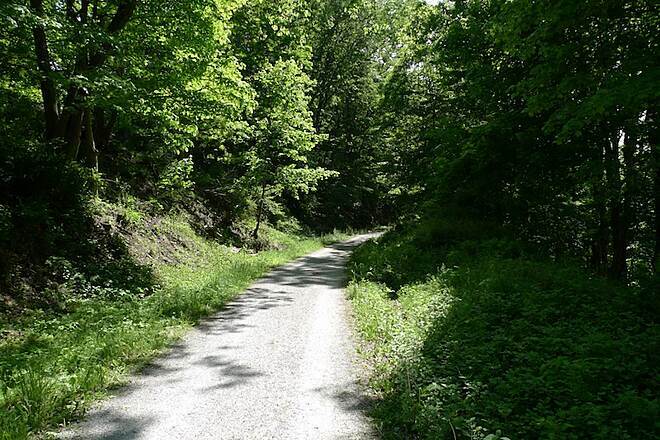 The majority of the trail is gravel, with the beginning 1-2 miles paved. There are quite a few bridges, and some nice open scenery towards the end. The trail, from end to end, is actually 15.1 miles, so I'm not sure exactly how they're mapping it here. I used a GPS watch, so this figure is accurate. Milage signage up until mile six is about 1/10 of a mile too fast. If you wanted to be picked up at the end, there are several roads which go through the area that should make it easy for someone to follow you. The entire trail is pretty straightforward; there are a few intersections where you have to look out for cars, but they aren't numerous. Part of the trail goes through some people's backyard, and Mill Pond Park is less obvious as to where you should be headed (just keep going straight!). No bathrooms, but there is a restaurant towards the end (Long Valley Pub & Brewery) which has gotten decent reviews that could be a possible destination. Overall, it took me a little over an hour to complete going at a fast 13mph and not stopping. If you are inexperienced in going long distances, the difficulty here might not suit you. Of course, you can always just go for part of the trail. If you're going to do the entire thing, I suggest taking two bottles of water, spare tubes and patches, sunscreen, and a cliff bar. If you're not stopping, a heavy lock is just going to weigh you down. It was hot today, but most of this trail is shaded by the trees. It was a pleasant ride for a hot day. The trail is mostly crushed stone from High Point to the 7 mile marker; and the rest of the way, 4 miles to next parking lot, was a bit finer gravel base. There are a number of benches along the entire trail to stop and rest. This is a very nice trail to ride. Too bad there was only a port-a-potty at the High Bridge parking area and not the other lot. There are also a number of places to eat in High Bridge on Main Street, walking distance from the parking lot and at other areas close by. From High Bridge to Califon there is an upward grade. A hybrid or mountain bike would be best for the northern section. Only one porta-john to be found in High Bridge. One of the best maintained rail-trails in the country. More about the Pixies and Fairies later. First, the trail: If you start off in High Bridge the trail runs parallel to the river, overlooking a fantastic gorge. You will notice a very slight incline at this first leg of the journey (which becomes a very welcomed subtle downhill ride on your return). 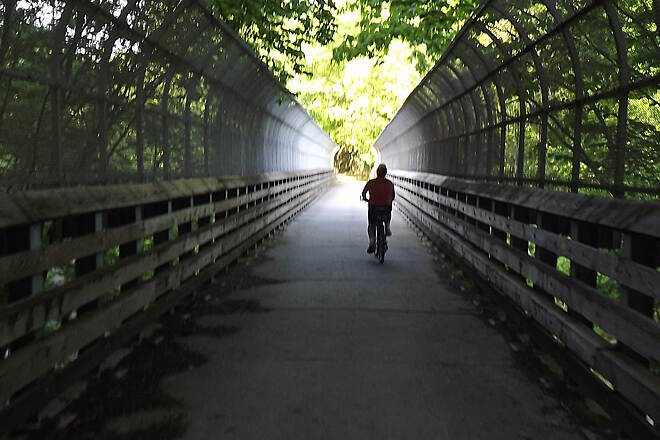 This ride will take you through woodland, a very well preserved railroad depot, some beautiful farmland and some really picturesque river landscapes. I have gone off trail on a couple of intersections I've encountered and have been rewarded with great views. Pack a camera for this ride. You won't be sorry. Now, to the Pixies and Fairies. At the beginning of the ride, from High Bridge, pay attention to both sides of the trail. Here and there you will come across an array of small "structures" (resembling houses, garages, cabins, etc.) that have been placed on rocks, under trees, next to a brook,etc. Most of them are very artfully decorated. 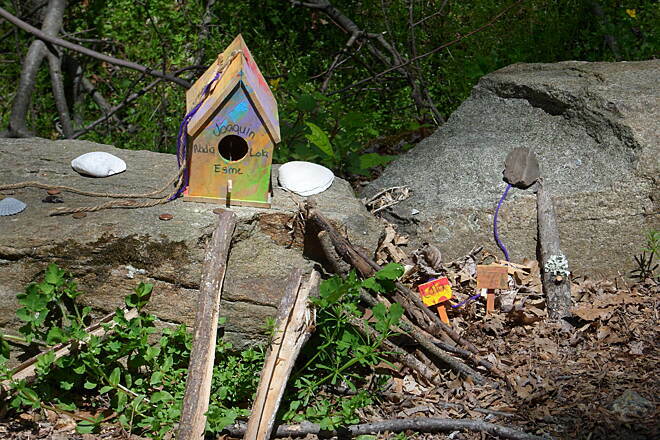 Some of them even have their very own miniature mailbox!! 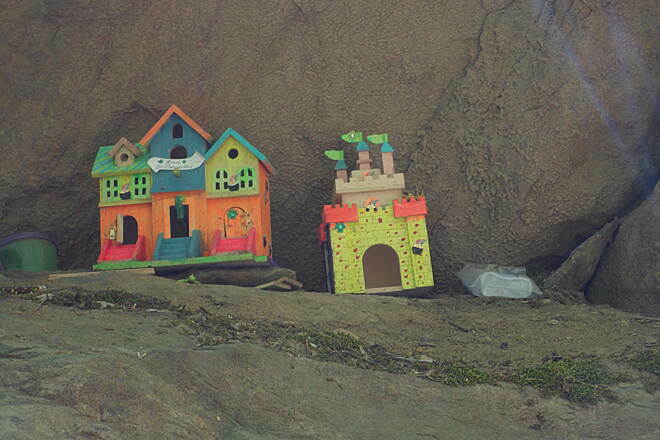 (I guess they are made to resemble the dwellings of some mystical woodland beings?? Hey, maybe they do exist!!) I have yet to discover the who or the why of this whimsical display but it makes for a very fun, interesting ride. Take time to stop and take a closer look at them. 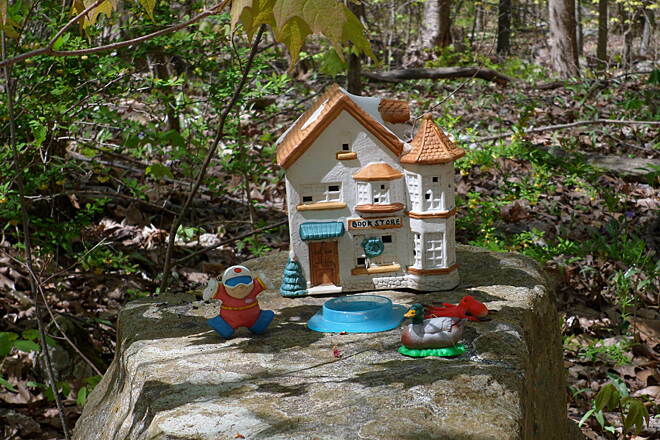 Someone has gone to a lot of trouble to create a miniature land of makebelieve along this trail. 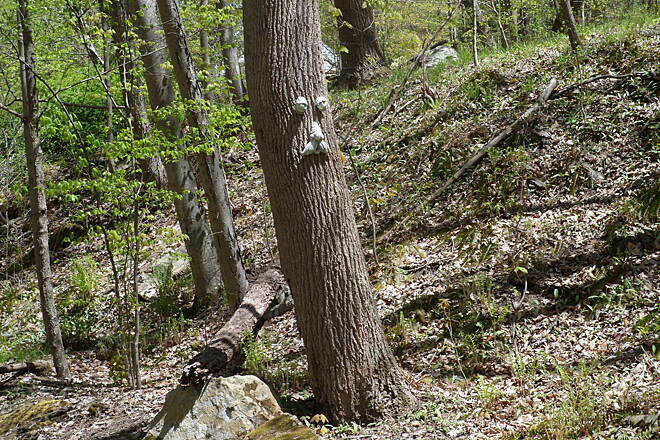 This is by far one of the most unusual things I have encountered on a trail. Take a ride and check it out! Overall, this is a very, very good trail! 4/30/12: My wife and I rode this trail today for 30 miles round trip. We were coming south on the US206 & turned right as instructed on Bartley Rd and found a trailhead about 3 3/4 miles above Schooleys Mtn Rd. 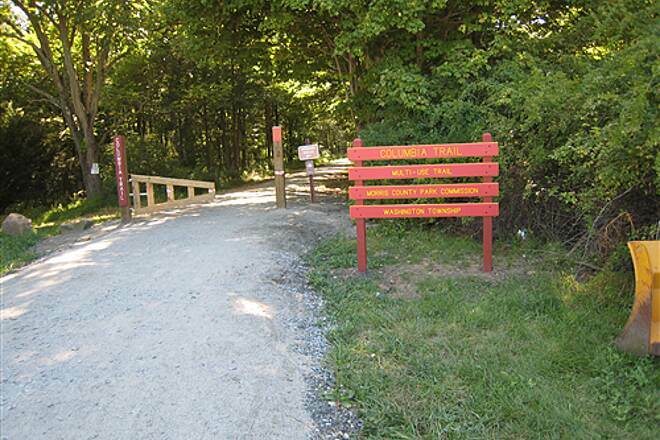 The new trailhead is between 1/4 and 1/2 mile north of West Morris Central High School. Also, about 1/4 mile south of the trailhead there is a fishing access parking lot, though not easily spotted. We thoroughly enjoyed our ride all the way to High Bridge. We encountered a couple of very short stretches where the trail was soft and at the very upper end was a little very rough gravel that made going tough, but most of them could be skirted on the edge. Also, there were a couple of spots just north of Schooleys Mtn Rd behind a steel yard where there was some recent rain damage. We (a 70-yr-old and 60-yr old on hybrid and cruiser bikes, respectively) rode this trail on September 26, 2011. The trail is mostly crushed limestone and ballast. A few short portions are asphalt and the bridges are generally concrete. The trail was in really good shape, especially considering the hurricane, tropical storm, and several days of rain that have hit this trail recently. All the downed trees have been removed from the trail, the deepest 'potholes' have been filled with stone or dirt. A few small dips remain and we experienced several areas that were a little muddy. The only real 'hazard' we encountered was the walnuts falling from the trees onto the trail (we initially thought someone was throwing things at us :-) We started our ride in High Bridge after stopping for a quick lunch at the cafe connected to Casa Maya less than a half mile from the trailhead (also serves breakfast). The trail was an easy ride out with a slight uphill grade (we didn't really notice that grade until we were coming back and realized we were rolling quite a bit faster on the return than we had on the way out). 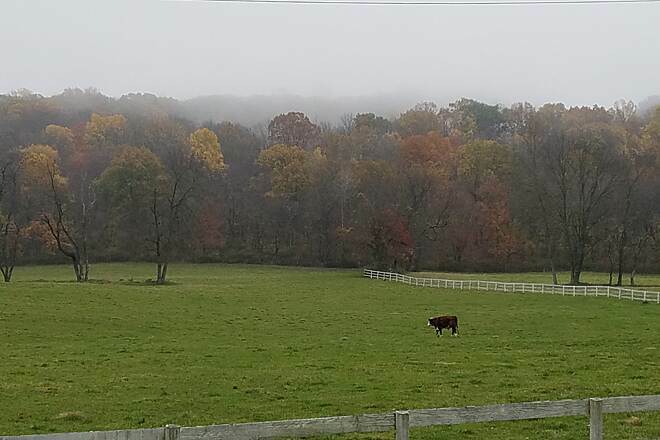 Lots to see on this trail: wildlife (squirrels, rabbits, muskrat, ground hog, deer ); rural areas with old barns, cows, and fields; a nursery; wildflowers; trees changing color; water running along either side of the trail; canopy of trees over the trail in several places. Benches are placed every so often along the trail. Rest rooms are located only at the High Bridge trail head. We passed through one small town and ended the ride in another small town. Looked like there were places to stop and eat in those towns, tho we didn't explore. All in all, this was a beautiful, easy ride on a gorgeous day! This was a wonderful trail. The trail is high above the canal with a great view. The canopy of trees makes it cool and also protected us from a bit of rain late in the aftrenoon. Cute towns along the way, friendly people and great riding surface. I can't wait to go back! It was the perfect ride. We went in August and I can imagine that the ride would also be nice in the fall with clearer views of the canal. I rode from Bartley road to High Bridge on this great trail. I showed 14.8 miles one way - 29.6 round trip - from the begining parking lot to the nice park in High Bridge with picnic tables and a much needed porta- john. The trail is well kept and actually on this trip they were putting down some hard pack in a couple of low areas. There are a number of road crossings but only a few with any amount of traffic. With the leaves off the trees you could see so much more scenery from the trail that you can't see in the summer. This trail is without a doubt a must ride for any rail-to-trailer. A super trail with easy accesses at both ends and at various places along the way. 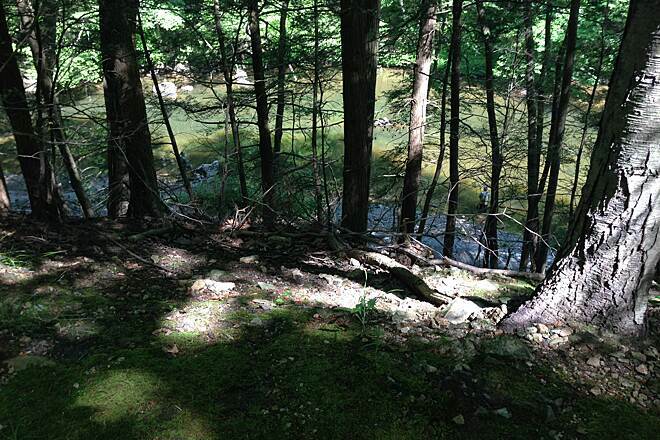 Immediately from the High Bridge trail-head you are deep in a wooded and shaded envelope. 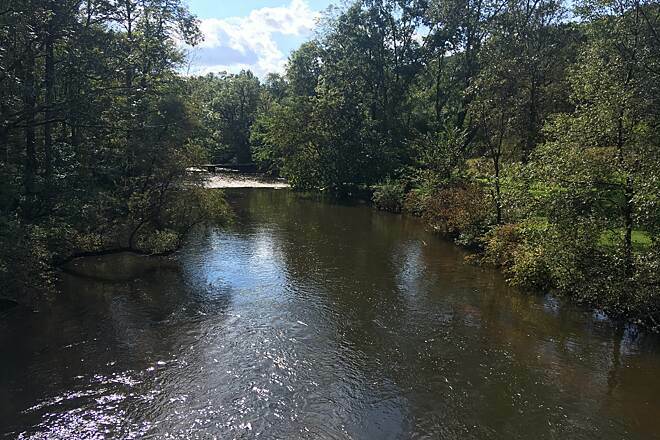 Much of the Hunterdon county section runs along the south branch of the Raritan River which provided some nice ambient water sounds. 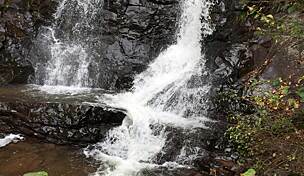 A great waterfall near High Bridge end is a great diversion. The trail itself is a well-kept firmly-packed mix of fine gravel and hard surfaces. Only a handful of street interruptions in the 11 miles. And it's not like the cross streets are busy, you're very rural out there. The trail is almost entirely level, no climbs or even hints of climbs. A great ride for kids. A great ride for anybody! I did the Stamforb to Bloomville section, an out-and-back of about 25 miles. I parked at the old Bloomville station, and was the only car in the lot on a Sunday afternoon, which I found immediately appealing. 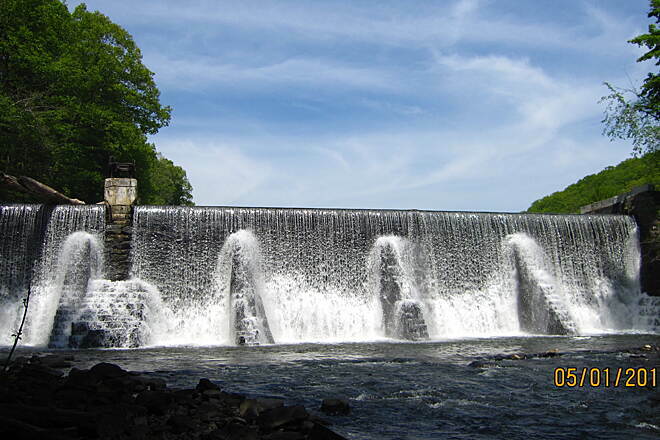 The treil follows Route 23 and the Scoharie Creek, which is too rocky and low for scads of tubes or rafts, so there is virtually no tourist traffic on the water. If you like riding in relative solitude as I do, this trail is for you. The towns along the route are quiet, forgotten farming hamlets of a couple dozen houses....a real step back in time. In the 3+ hours I spent on the trail, I passed 4 other bikers and 3 hikers. I gorged on black raspberries at severeal spots, as well as some wild grapes (muscadines maybe ?). In some places, the smell of wildflowers and/or cedar is overpowering. Since there is virtually no traffic on Rt. 23 in this area, ther were no fumes to detract from those nature provided. Only a couple of spots where the trail was slightly degraded, but for most of its length you could ride an old school 10 speed without getting stuck. Be prepared with your own drinks and food, since there is almost nothing up there. Did an out and back on this trail a couple weeks ago. I started from the north end at Long Valley....somewhat limited parking here ( i got the last space), but that helps keep the traffic down on the trail. Well maintained and quiet, the trail doesn't get too close to a main road very often. 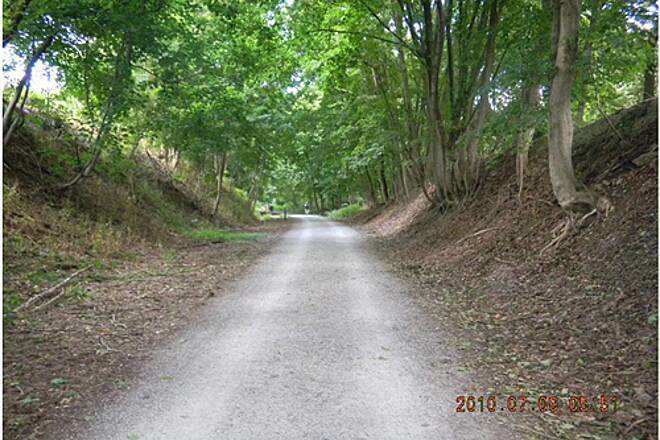 Most of the crossings are gravel roads to 1 or 2 houses, though you do cross the main drag at one point. There is a good mix of scenery, old houses, corn fields, streams, etc. For being in New Jersey, the traffic on the trail was not bad. There are a number of relatively small parking areas along the route so all the traffic isn't concebtrated in one area. We love this trail..anytime of year. It is great to walk even in the snow. Rode part of the Columbia trail today but had to stop due to the rainy weather. Can't wait until next time hopefully we will complete the trial. It only took me living in Long Valley for 13 years to discover this trail.The only complaint I have is what the horse's left behind . One bridge was totally covered. If we have to pick up after our dogs ..I think the same should apply with horses. What a gorgeous trail! Could not agree more with others. My wife and I took the trail this AM going from High Bridge to the "Taylor SteelWorkers Historical Greenway" (on this site) trail, took it to River Road, and biked the road to Califon (read my post on that trail on how to get to River Road). Not a single car passed us - and about 2 miles of the road is currently closed to traffic. You actually get a better view of the Raritan from the road than the trail. Anyway, third trip - and it's nice to have a loop! Ditto on Califon General Store (really a small deli) for lunch! How lucky I am to be able to call this my home town trail. This little bit of heaven on earth is a can't miss for anyone that rides. 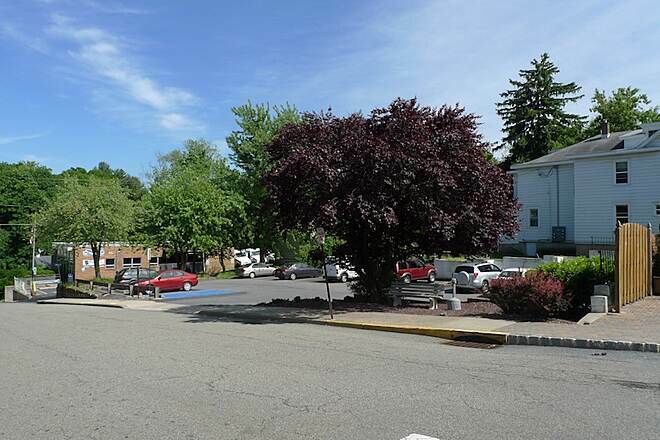 Park at the Commons in High Bridge and head towards Califon. The first part of the ride is a bit of an up hill battle but just past the second trestle it levels off real nice. 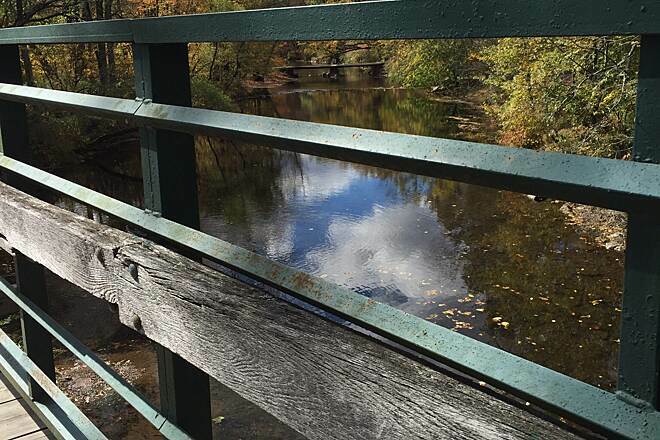 Talk about views stop on that trestle and enjoy the scene it is one of the most beautiful the state of New Jersey has to offer! 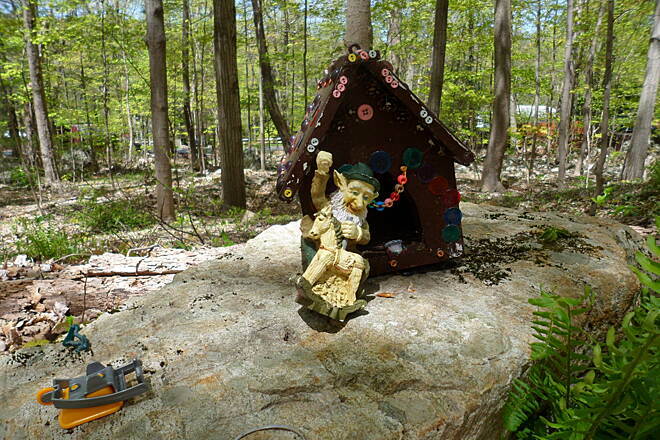 Continue on to Califon, there is a porta-potty in the Island Park just off the trail and several places to grab a bite to eat or get a drink. If it is not Sunday do Rambo's it's a slice of Americana you will love, it's easy to find when you hit the front of the fire house turn left it's just ahead on your right, it is closed on Sundays so if you need to refuel go a bit further and over the bridge on the left is the Califon General Store. Back on the trail continue to the county line, where you will have completed 7 miles. You can continue on into Morris County from there (watch for the big dipsy do on the trail a little past the next bridge) once in Long Valley you get a bunch more places to grab food and drinks. For you really good riders the trail will continue into Flanders and at some point, don't ask me where but I do believe it links to the Patriot Trail. Regardless how far you go it will be a ride you will be glad you did and will want to come back for more. PS If while you are in Califon and you make it down to Rt. 513 there is a Pet Supply store stop in and say hello. I have always felt lucky being able to call The Columbia Trail my home town trail. Anyone who has never had the honor to ride this trail is missing something very special. 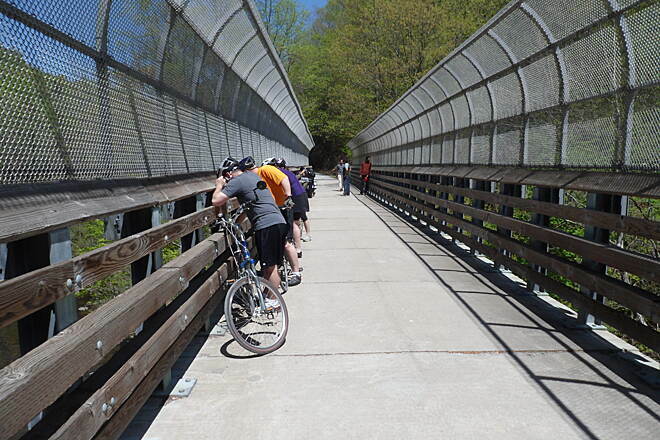 I regularly ride the 7 mile section from High Bridge thru Califon to the the county line. The parks department keeps it in excellent condition and the views are breath taking. Rode this trail from Long Valley to High Bridge & back on 05/16/10. 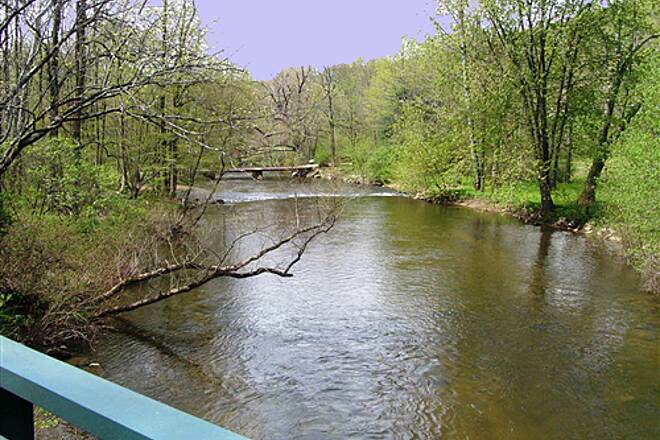 This is really a beautiful ride through wooded areas with the South Branch of the Raritan River in view for much of the ride. The trail condition was very good with just a few rough patches. The trail gets more usage near High Bridge but a couple of miles away and you'll probably have long stretches to yourself. You can maintain good speed for long periods with few interruptions. High Bridge is a great little town with some fun restaurants. I lucked out: as I came to the end of the trail, I could hear live music playing. Circa Restaurant, a block down from the trail head, was holding a free music festival called Mayfest with a great band. Excellent microbrews & BBQ available as well. I didn't want to leave! 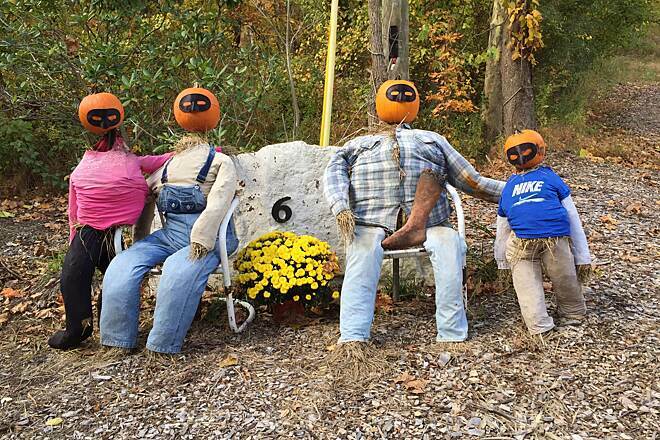 Califon is like a Norman Rockwell painting. If you're into fishing, stop off at Shannon's Fly & Tackle shop, just a short block off the trail on Main Street. The owner is a friendly guy who loves to talk fishing. Warning: there's no convenient places to grab water or snacks along the way, so make sure to bring them along. One note: the trail is uphill from High Bridge to Long Valley, so take that into consideration when planning your trip if you're a casual rider. I just did the section starting at the eastern terminus near Flanders and ending at the Morris/Hunterdon border parking lot. This was a very enjoyable ride through forest and farmland, and most of it was in close proximity to the river. The condition of the trail was excellent all along the way, but a bit bumpy on the most western .5 mile. I measured the Morris section just shy of 8 miles. The trail is generally in great condition: all the washouts from last year were repaired well. Near the High Bridge trail-head a local Boy Scout is working on a bench overlook of the Lake Solitude lake and Dam. 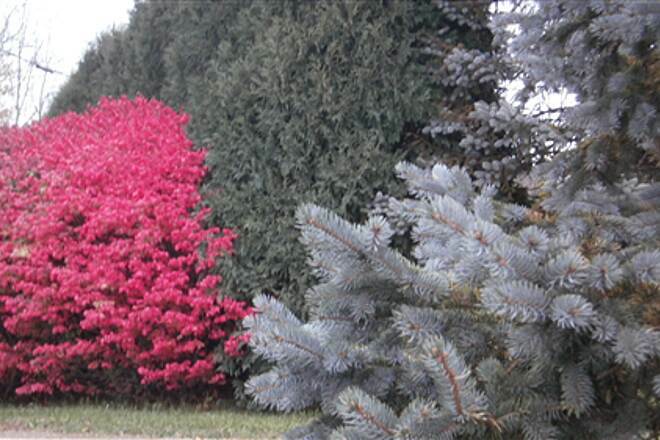 This will be very nice in the summer and fall. 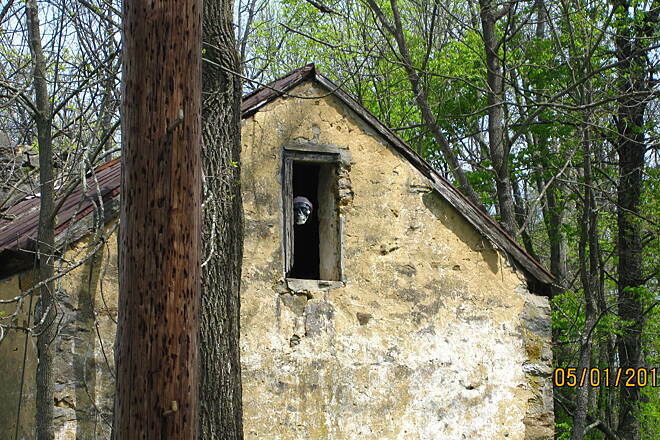 Also, he is re-blazing the old "locals" trail that heads down to the Taylor Wharton factory property. This will connect with other trails on preserved land recently acquired by the town. The result will be a great local network that would make any UK preservation group proud! Cross country skiing is excellent this winter, though many users, perhaps through ignorance, do not respect the ski trials that have been cut. The further you get from the trail-heads, the less foot traffic there is and thus the better the skiing. The patches were great the first time we rode them – that was right after they were completed - but by the following weekend the horsey girls had ridden all over them, chopping the softer patched areas into very rough corrugated surfaces. Then when the rains came back, the big hoof divots in the newly repaired areas had caused irregular wash outs again. This has greatly diminished the pleasure of this one smooth and easy ride. Also, at the nursery, just as you enter the woods going west, there’s a 10-yard stretch where the gravel used to repair the trail is not packed at all, and if you aren’t careful you’ll end up beaching your bike in the “drifts” or sliding to a fall … we found that you’ll want to stay to the far left if you can, where it is a bit firmer. Does anyone know the current status of the mile markers on the Columbia Trail? 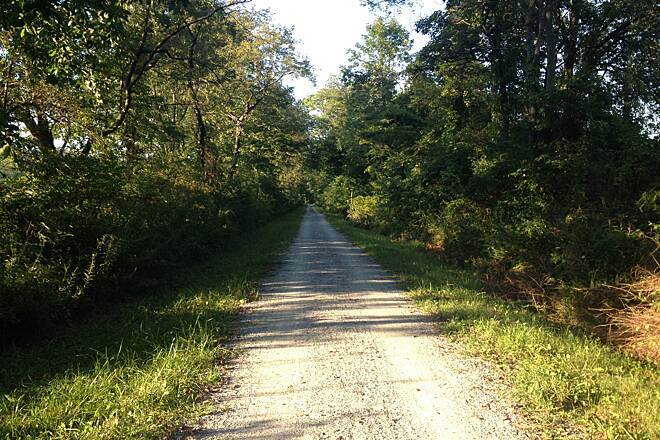 I plan to do my marathon training on this trail this summer. I did a few shorter runs this winter, taking me a little over 4 miles out and back from High Bridge and it was well-marked all the way. My understanding is that the full length of the trail from end to end is now about 16 miles. Is this correct, and if so, how far do the markers extend? 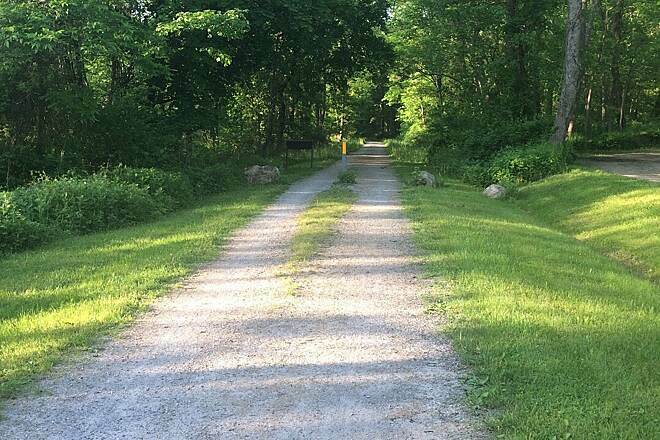 The Morris County Park Commission has done considerable work on the trail from Schooley's Mountain Road in the middle of Long Valley to where the trail meets the Hunterdon County line. The trail has been widened and a base of 3/4 inch stone from 2-4" deep, covered with an additional 2" of packed stone dust, has been laid down. 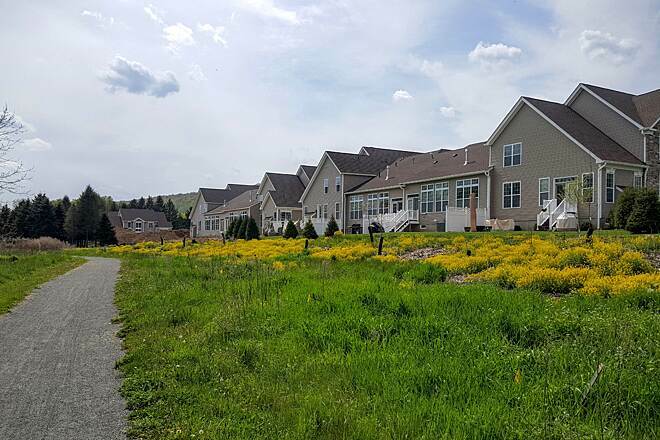 The Park Commission is in the process of putting in mile markers continuing from the Hunterdon County line to the Schooley's Mountain Road Parking lot ( A total of 4.1 miles). 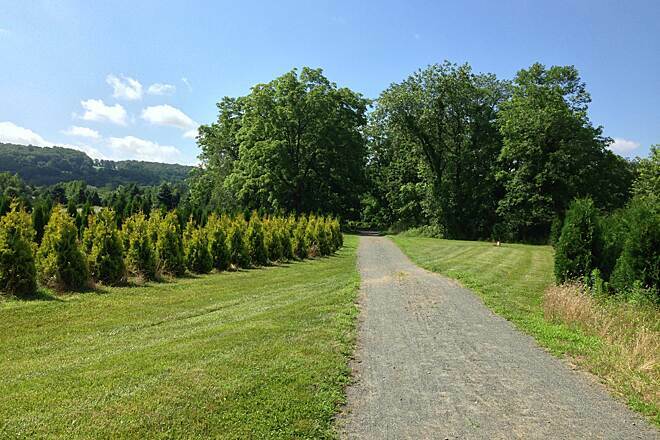 There is an additional parking lot where the trail crosses 513 close to the Hunterdon County line. Maps are available in the map Kiosks as well as Cycle Craft ( a great bike shop on 513, not far from the Schooley's Mountain parking lot). 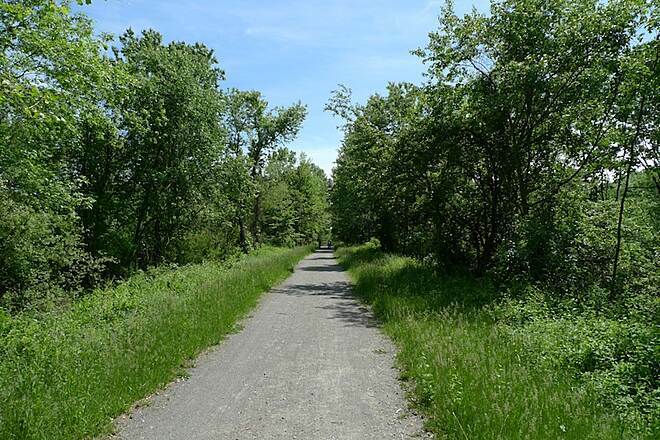 Plans call for work to be done on the trail starting from the Bartley Road side and continuing until the center of Long Valley and connecting to the finished trail, with extensive trail work to be done behind the Toll brothers development as well as the Steel plant. The trail has been an active trail for many years, with the new work done it has enabled that many more families to get out and enjoy the beautiful countryside of Long Valley. It is great to see the Park District put so much time and effort into the trails for the enjoyment of everyone, hikers, bikers, horseback riders. It is quite apparent that the public agrees: On any given weekend this fall the parking lot was packed, during the week there are quite a few using the trail also. Thanks to all of the Rails to Trails members also as the Park Commission used a Grant from Rails to Trails to help fund it. ACCESS AND PARKING: Open daily from dawn to dusk. There is good parking at the High Bridge Municipal Parking Lot at the southern end of trail. There is no parking at junctions of trail with area roads. 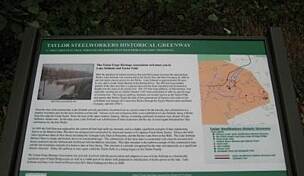 Created by Union Forge Heritage Association in 2007, the Taylor Steelworkers Historical Greenway can be accessed approximately 1/4 mile from the start of the Columbia Trail. 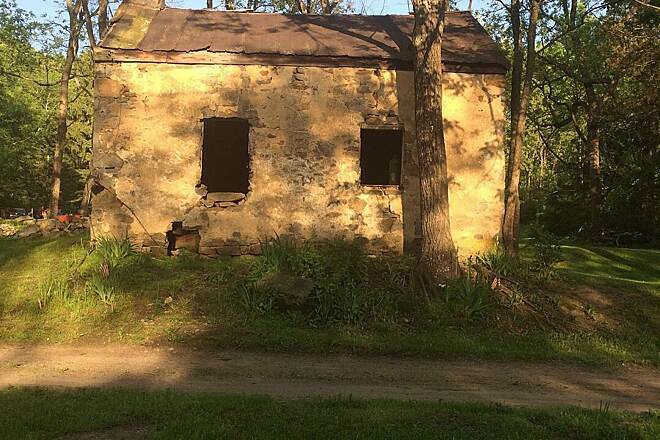 The trail can also be accessed from Solitude House Museum (circa 1717), the historical Taylor Ironworker and Steel Company Complex, the oldest standing example of ironworks administrative structure (TISCO)(circa 1742) and Springside Farm (circa 1803). 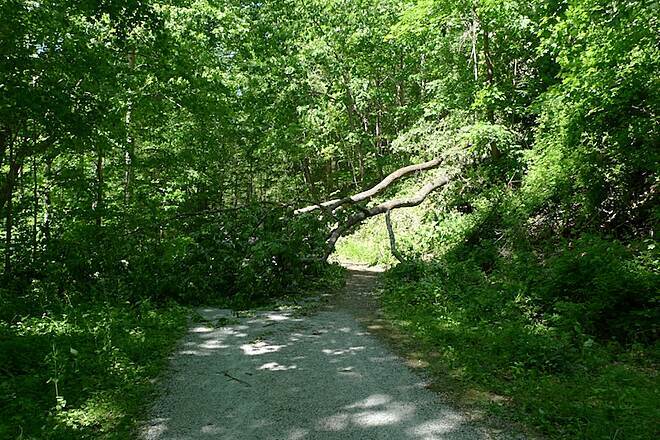 During inclement weather the trails may not be accessible. No motorized vehicles of any kind. Parking is available at the TISCO Complex, Solitude House Museum and Springside Farm. WILDLIFE: Bald Eagles are a familiar sight in the region. They often are easier to spot in winter when trees are bare of leaves. Check the trees along the trails; seasonal sightings include Brown Creeper, Eastern Phoebe, Ruby- and Golden-crowned Kinglets, Blue-gray Gnatcatcher, Palm, Pine and Yellow-rumped Warblers and Yellow-throated Vireo. Look a little deeper into the woods for Hermit and Wood Thrushes, Veery, Ovenbird and Red-eyed and Blue-headed Vireos and Pileated Woodpecker. DON'T MISS: Several miles north of High Bridge, the Columbia Trail passes over Ken Lockwood Gorge Bridge, built 80 feet above the gorge floor. This steel span was built in 1930 to replace the original wooden trestle bridge, which was the site of a memorable 1886 train wreck. Approx 1/4 mile from the High Bridge municipal parking lot (right side) is the trailhead of the Taylor Steelworkers Historical Greenway a 6.4 mile trail encompassing most of high bridges historical properties. Connecting bridge over SB Raritan set to open in 2009. 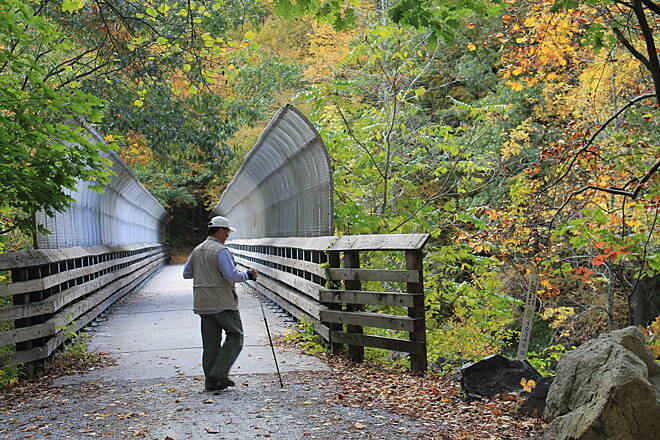 Great biking, birding and hiking trail. Columbia Trail ride from Long Valley to High Bridge and back. 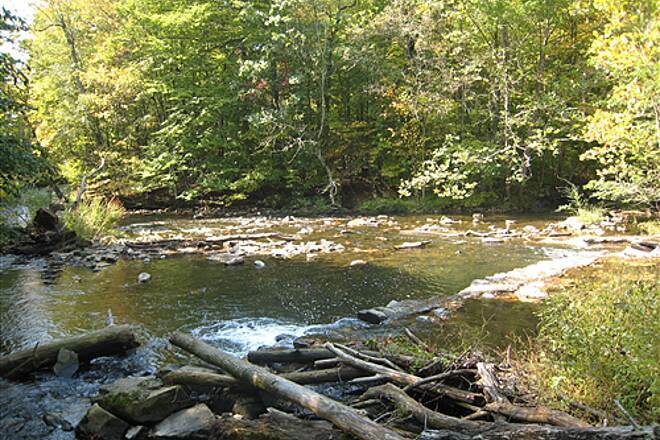 In late April 2008 five of us rode the trail from Long Valley where it crosses Route 24. The sign only states Authorizes Vehicles Only. The Morris County section was mostly graded with dirt and a little rough in spots. I missed the go around by a small auto junk yard where the grass was really soggy and muddy. When you come out to Rt 513 near the nursery there were no signs of where the trail picked up again. You have to go south on 513 about 150 yards and ride along the edge of the nursery. 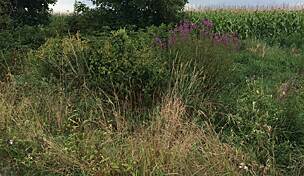 Turn in by the tall wooden fence along the nursery border about 100 yards in and you will pick up the trail again. You will know when you cross over into Hunterdon County. The trail now becomes smooth, hard compacted gravel and remains a wider path. If you need food or drinks stop in Claifon. 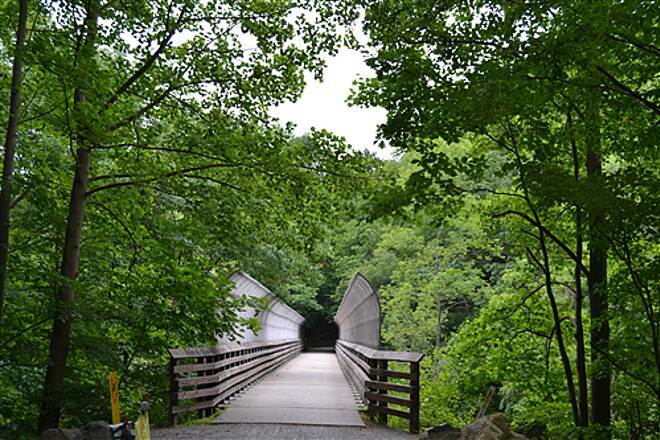 Once you pass through Califon you enter into the Lockwood Gorge, Wow! Its an awsome view all the way to High Bridge. The folliage was just beginning to sprout so we had a great veiw of the gorge all the way through. If you do any part of this trail this is definetly the section to do. Once you get to the parking lot in High Bridge the trail ends. On the return trip we rode the down to the fishermans road along the river. I has a few small hills but its worth the effort. There was a section about 30 yards or so you have to walk beause the gravel has washed away. I plan on going back again now that the folliage is out and probably again in the fall. The entire ride had less than 3% grade, except for the river trail. If your out of shape and want to ride this is the place to start. If your in shape you can plan a 25+ mile round trip depending on your starting point. If you start and finish in Long Valley there is a Bike shop that rents bikes at the intersection of rts 24 and 513. The Brew Pub is also a nice finish to a great ride. 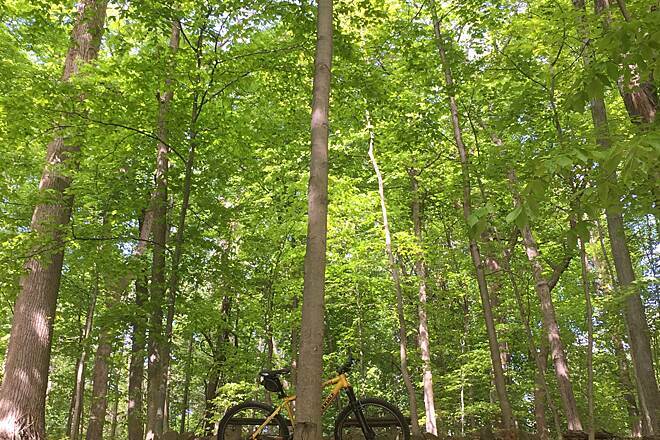 "My wife and I had a good time biking this trail. We covered the distance from High Bridge to Long Valley where the trail meets up with Route 513 and a tree nursery and back. In the end, our trip odometer read 19.5 miles, travelling between 5-10 mph along the route. The path is mostly gravel. Towards the end of our route, it was dirt. If we wanted to continue on, the trail picks up diagonally across the road ( Route 513) where there is a sign that says only official vehicles permitted beyond that point. It is actually the trail and not someone's private road. I double-checked this on Google Earth which I can suggest to any biker for any trail. For the segment of the Columbia Trail described here, I used my road bike and it was okay, but I think a wider-tired bike would be better. We parked at the municipal parking lot of High Bridge, free of charge, and crossed two streets to the official beginning of the trail. The trailhead is marked. Approximately a mile past the trailhead, we already encountered some deer feeding along the trail and they promply fled downhill towards the river below. At this point, there is a tremendous drop towards the river on your right. The route is shady. Although the greenery is lush and foresty you can still get glimpses of people's properties along the route. Of course, towards the street crossings, things get just a tad populated. Califon is a nice, small town. There is a deli down the street towards the bridge, in case you want a snack. By the way, there is a restaurant on High Bridge's main street serving good lunch. I didn't see any comfort stations along the route so plan accordingly. Overall, this was good outing and a day nicely-spent." 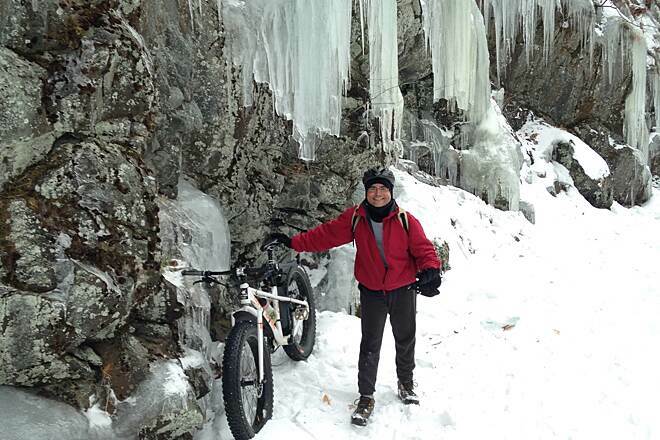 "Came up from DC to ride and it was worth it, amazing trail with little bit of everything, rivers, bridges classic cars, christmas tree farm, views of the gorge. " This trail is great for those who like to travel uphill one way and downhill on the way back. Fourteen miles of great scenery from High Bridge to the county line and back. I think this is a great trail for kids who like biking. 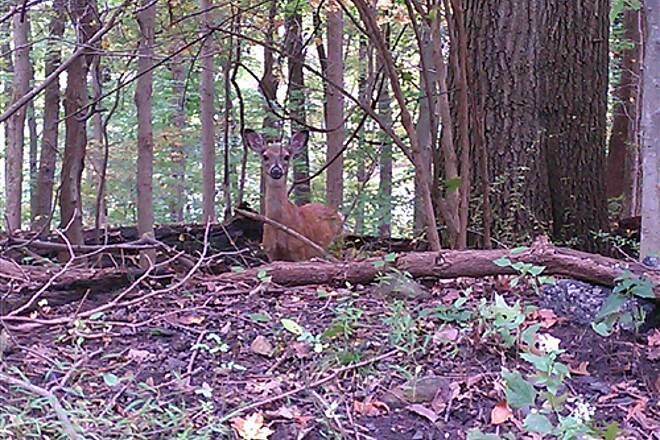 Sometimes you could see deer (really happened!) and rabbits (really happened!). If you have kids who think they can ride on crushed rock paths I think you should try it. 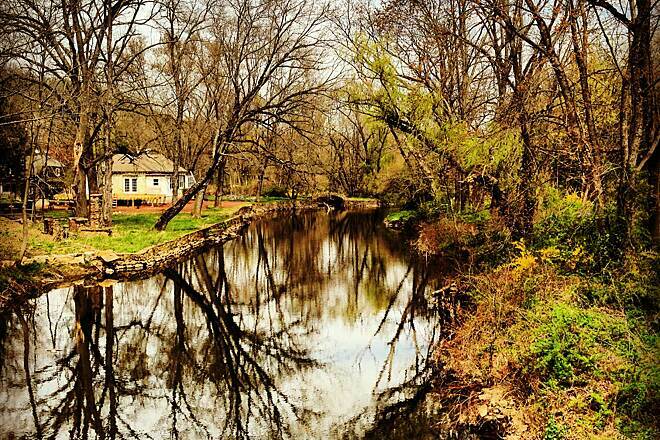 "This trail's scenery truly epitomizes why New Jersey is nicknamed the Garden State. I finally got to do this trail today as I was home visiting the folks in Flanders. The calm before the storm. It was difficult because of flooding in certain spots, but that's because of the heatwave. This page does not say where to access it in Flanders but someone posted it's off of Bartley Road. If you're on 206, make a left (or right) on Flanders-Bartley Road (before the bridge across from the shopping plaza). It turns into Bartley Road and you can follow the old railroad tracks on your left. When they cross the road, you turn right with the road and just ahead on your left you will see the tracks end with a triangle stopper (whatever it's called). The trail starts on your right across the road. 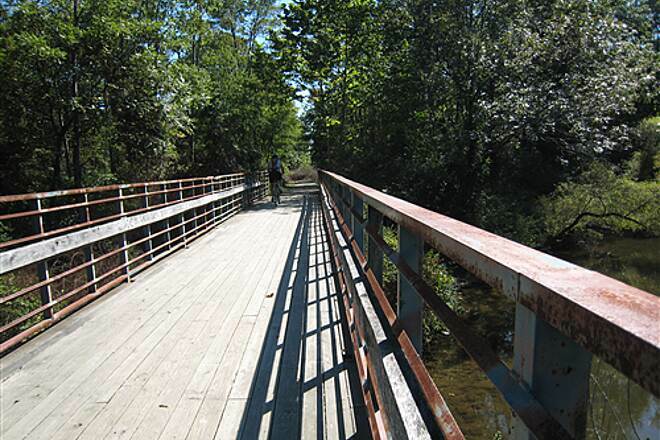 There are adequate bridges and many trails leading off into the woods. From Flanders to mid-way of the trail it's mostly singletrack and grass and gravel. A few miles into the trail you will see another trail on your right called ""Gillette Trail"" named after a recent Morris County Parks Commissioner. Follow that to the lot and you'll see a map of the area. 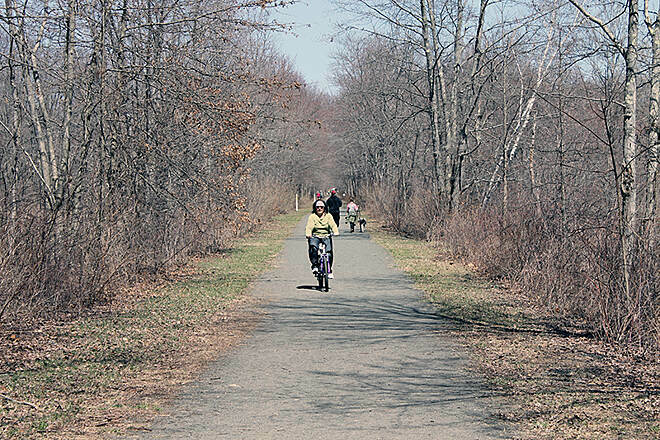 It's for hiking and biking and it's a huge park trail system, part of the Patriots Path that connects about 5 large towns in a circle of parks and trails from Schooley's Mountain to Peapack to Mendham and Chester. Eventually you will come to a company parking lot and you just follow the parking lot until you hit the trail again. Then you will come upon Welsh Farms Dairy and you follow the lot until you come to a bridge. It's very unstable and there's a gate stopping you. You can go around it to the road or carry your bike and walk carefully across it. There's a mini bridge right after it. This part of the trail is quiet, nothing but the river and wetlands following you and wildlife, such as dogs, cats, squirrels, the occasional turkey vulture and sheep and horse in the farmlands. Then you'll come across a car junkyard and a nice bridge to rest on. On your right ahead down the river is another bridge, common on the trail that connects neighborhoods and private roads to the trail. On your left in the background is an amazing stone arch connecting an island. In some spots, the trail parallels an existing neighborhood road and the joggers use this. 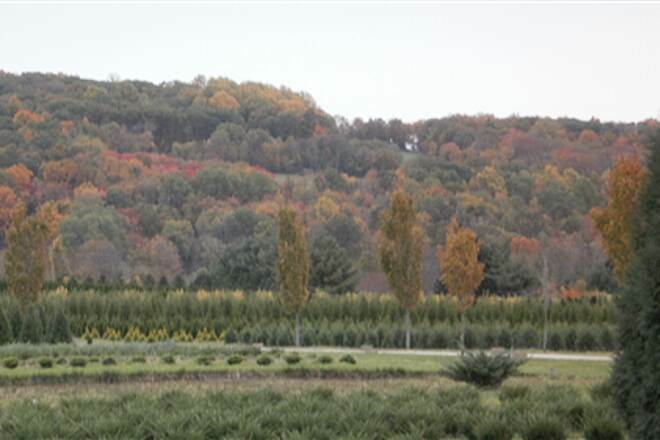 This part of the course leads you out onto a main road with a beautiful view of mountains in the background and a tree farm/nursery of many hundreds of acres. There is poor signage here. Make a right until you see the farm wood picket fence on your left and turn across the road. Follow the fence until it ends and then take a right back on the trail. Hint: All along the trail are yellow natural gas markers. 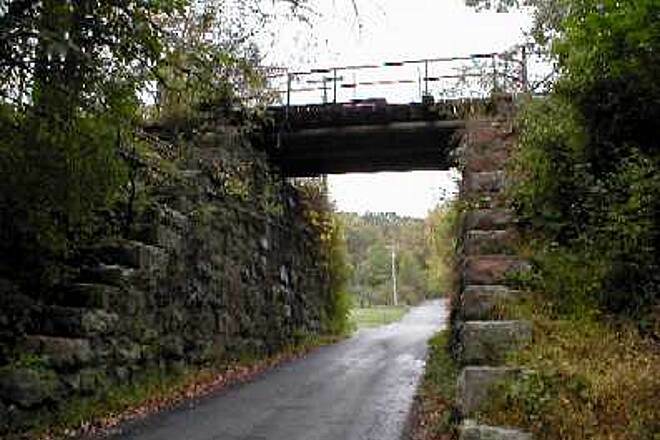 (If you made a right and kept going down the road you would see a stone bridge abuttment on the right, maybe an existing siding to a farm or dairy of past. This part of the trail is the best as it's all crushed white gravel and 10 feet wide. 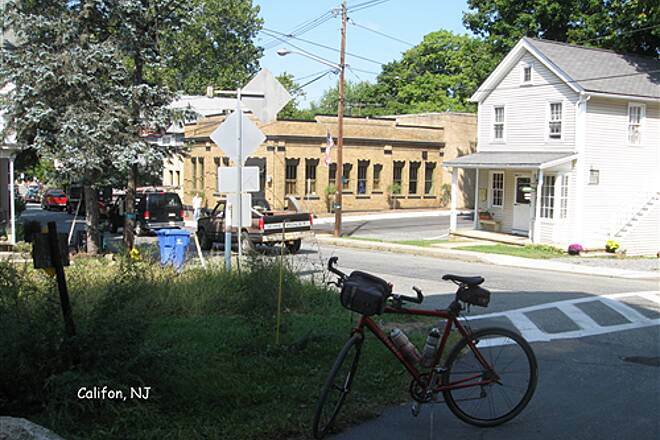 You'll pass through Califon and see adequate bike signage ""Share the Road"" signs. 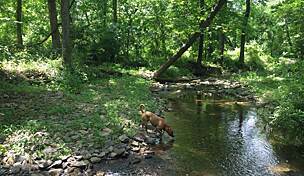 It goes through many neighborhoods and provides many detours to town centers, bridges and swimming holes. 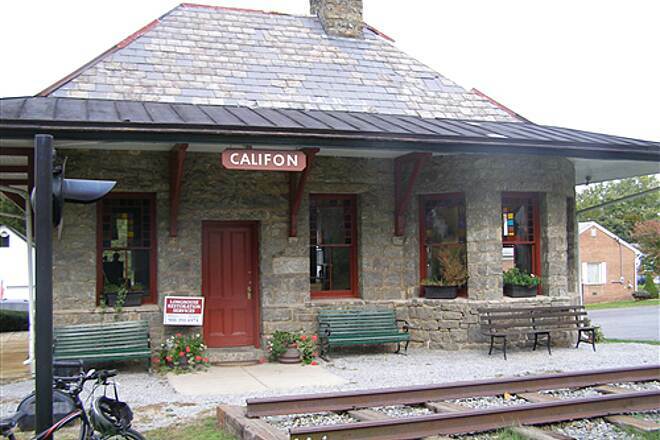 The Califon train station is ahead on the right later on and it's now a historical museum, open the 1st and 3rd Sundays of each month from May to December. In front is an old section of the railroad tracks, a train signal and a bell. There is a small rock cut up ahead on the left with glacial ice, not yet melted. Up ahead is a parking lot and park and it will go through a neighborhood on streets but it's very quiet and barely any traffic. 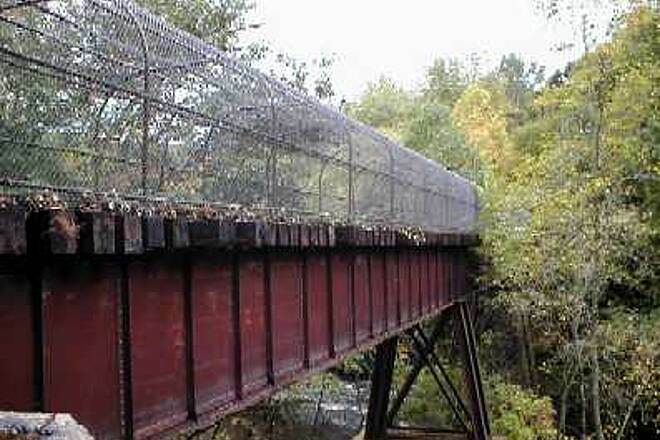 Then comes a long bridge with a fence on the top that curves inward and this is the Ken Lockwood Gorge. Amazing. 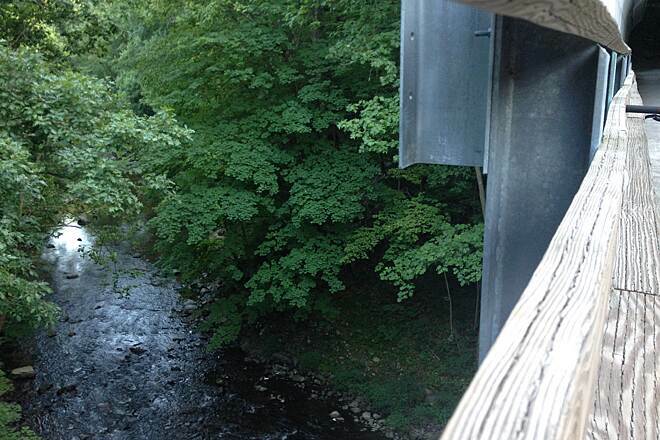 It's only about 100 feet up but the rapids start and in some spots are brackish swimming holes. Down below are joggers and fishers who use the trail below that follows the river. This part of the trail makes the mud in the beginning worthwhile. From here you are on the top of a ridge, and you feel you are high in elevation and you trace the mountains ridge and the river for the next few miles. Then the trail eventually turns to pavement and you know it's about to be over. You'll go under a bridge and it will end just up ahead. Cross the street and you will be in the parking lot/trailhead with picnic tables, playground and gazebo. Right as you enter, on the right the tracks begin again. If you follow them through the woods, it connects to the existing New Jersey Transit tracks. If you don't go to the trailhead, turn left and head downtown. At the top of the hill is the New Jersey Transit High Bridge Station. If you stand on the tracks and look ahead to the right, you will see a track stopper, the same from back in Flanders. 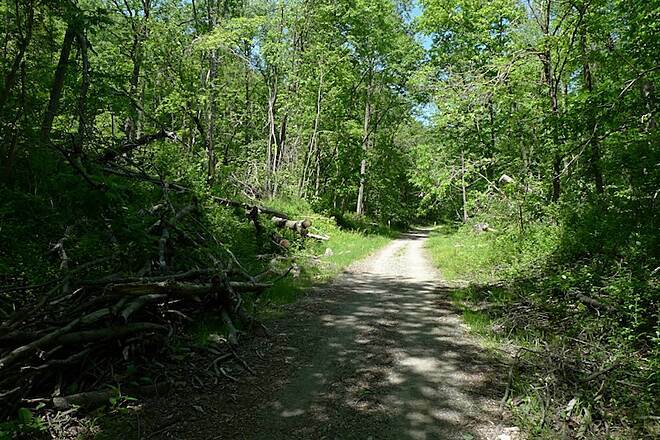 The best part of the trail is the last 8 miles and going through Long Valley and Califon, etc. 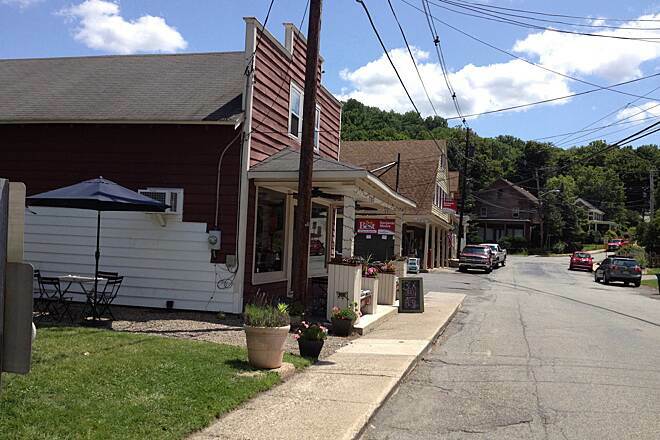 to explore the old mill and farm towns, antique shops and townsfolk. I counted 116 trail users in 16 miles. It was 42 right before the gorge and the rest were in the last 5 miles, mostly hikers and families biking. I rate it a 10, despite lack of one sign." 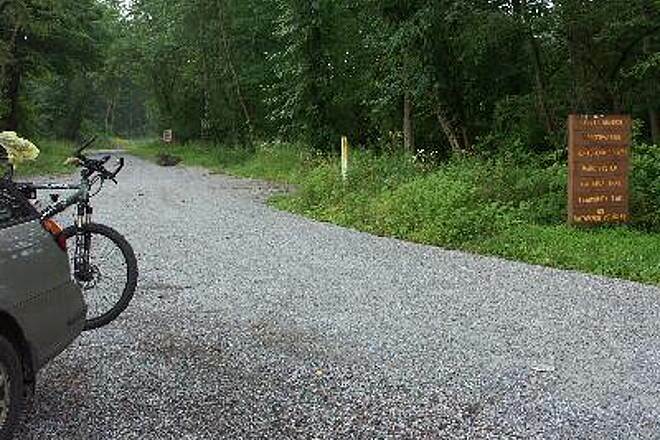 "The trail section from High Bridge to the Morris County border has been graded and re-surfaced. It is now open and the ride is quite smooth. It was closed for a year, but the improvement has been worth the wait." "We rode this trail, backwards, as far as we could, at the end of July 2003. It was closed at the High Bridge end. What a shame this trail isn't being used. Some bicycle clubs should adopt it to help maintain it. It is picturesque and a great place to cycle or walk. Though the part that is also used by the pipeline did get a bit uneven and brought up a number of rocks when the pipes were laid." 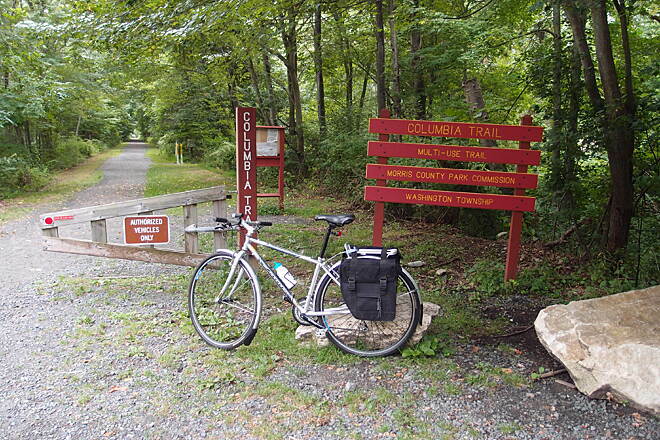 "This was my third ride on the Columbia Trail in two years. I'm disappointed that the western part of the trail is still closed since I think it's the best part of the trail. Overall, I like the ease of this trail. Nothing difficult and very tranquil. I finally got the hang of negotiating from where it appears that the trail ends at the tree farm, crossing over Route 513, and picking the trail up on the other side! It's also tricky finding your way back to the trail when it appears to end in Long Valley. You have to go around to the back of the old Welsh Farms property to find it. Well worth a ride here, especially if you're looking for an intermediate to easy path." This trail is awesome and though I have never gone past Califon I hope to when it opens for public use. It would be nice had this stayed an active railroad and then the town of High Bridge and the towns around it might have benefitted. But what can ya do now? "This was our first trail experience, and it was a blast. My wife, a beginner mountain biker, was apprehensive at first but quickly became adjusted to the changing trail environment. The trail starts out pretty smooth and with wide riding space but then miles later, it becomes a little bumpy and narrow. We saw some others with baby-tailers attached to bike, but it probably was too rough for the little ones inside. There were some great places to fish along the way, but no one has caught anything. The trail needs signs showing where it continues as each segment ends especially about 6-miles down the line. Trail map is needed. We were on the trail for about 5 hours and with the weather being so beautiful it was a whole lot of fun." 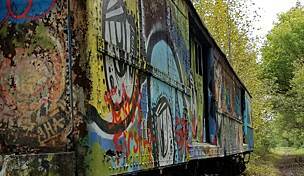 "A great rail trail if you like it a little agressive. If you're into fishing, bring along a rod; you'll be glad you did. 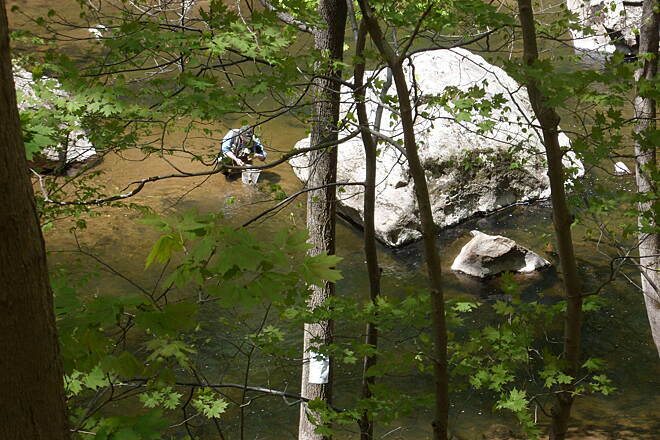 The trail passes many rivers and small lakes to fish. If you're into biking only, well this trail has rocks and roots to satisfy the off, off road junky. We're not talking big hills but there's lots of agressive riding. P.S. 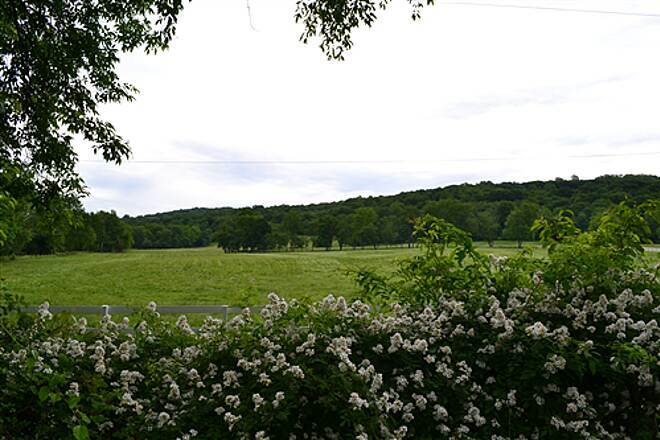 If you like to picnic, stop at Califon." 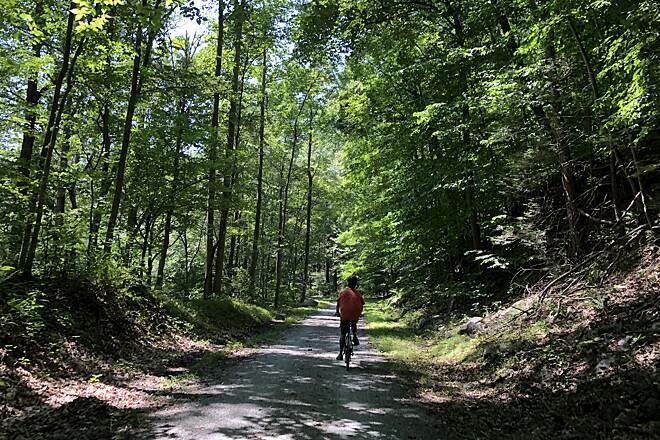 "Well-maintained trail right-of-ways, firm and dry surface conditions, ample parking at several trail access points, and limited off-trail detours all serve to make this route an ideal destination for the serious off-road bicyclist. 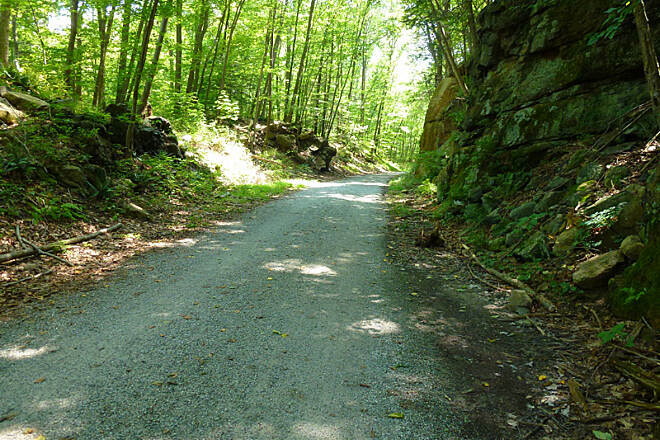 However, due to the excessive deployment of fine gravel along some sections of the Morris County trail segment, and some rather rocky conditions just north of High Bridge, I would recommend that you not attempt to travel this trail on a road bike. I traveled from north to south and then returned to my starting point. 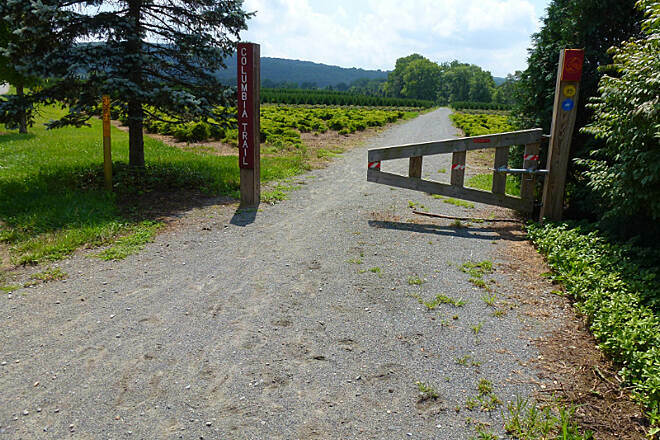 I parked my car and accessed the trail on Bartley Road in Flanders, Morris County. 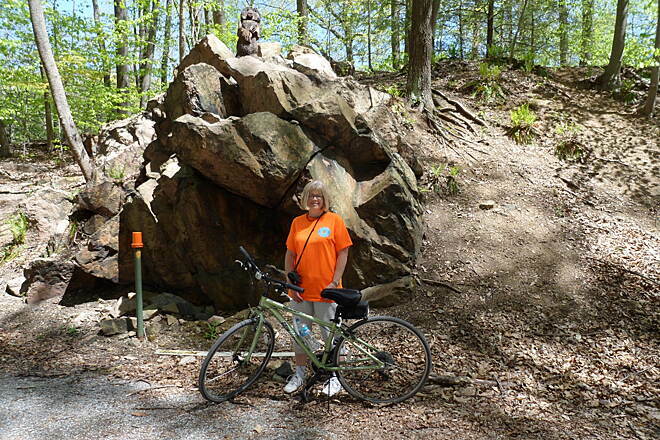 I cycled to the route’s southern most trailhead in High Bridge, Hunterdon County. 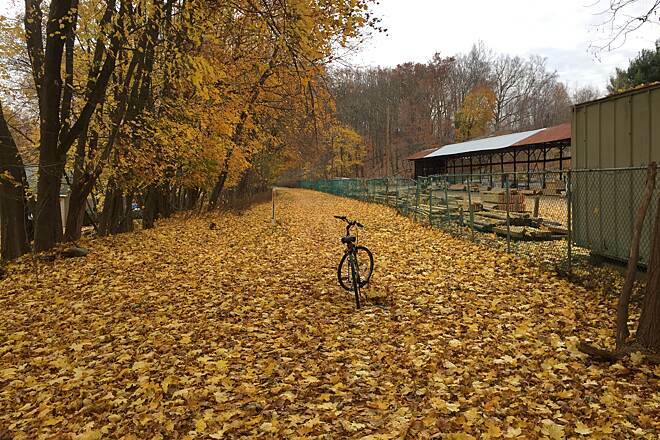 Along the way I noted that in addition to Flanders, ample parking is available immediately adjacent to the trail in Long Valley, Califon, and High Bridge. 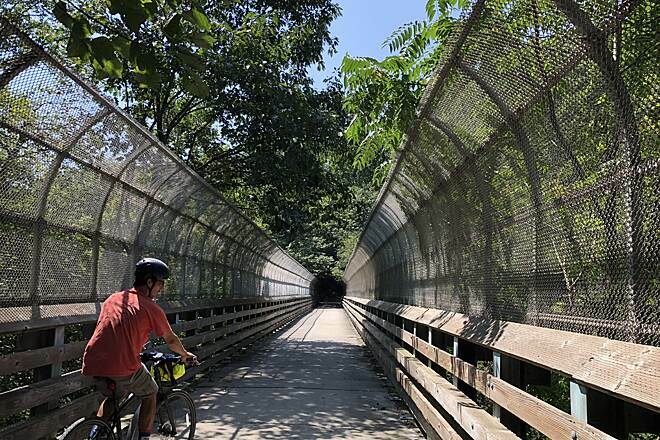 For those wishing to bring their bikes in via public transportation, the High Bridge trailhead is also within a few short blocks of NJ Transit’s Raritan Line train station in High Bridge. There are two minor off-trail detours along the route. One is near a steel fabricator and the Welsh Farms complex in Long Valley (dilapidated bridges will force you to walk your bike or use the street). The other is near a nursery on Morris County Route 513 (travel south along the road to the nursery’s fence line and then pick up the trail a few hundred feet east of Route 513 along the fence). 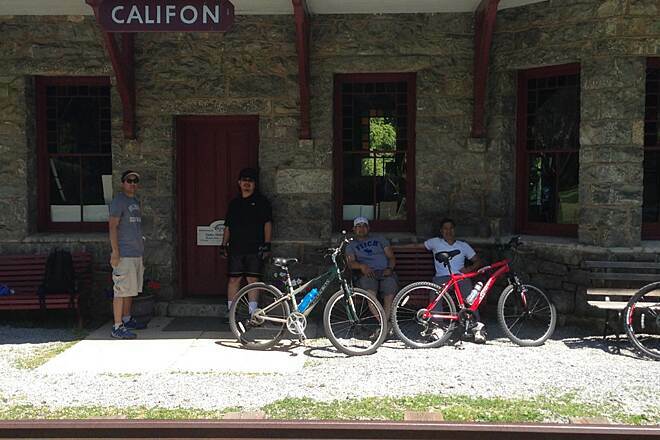 Services such as food and beverages are available very close to the trail in Long Valley, Califon, and High Bridge. Also, several portable toilets are stationed at the trailhead in High Bridge (the only place I saw any along the entire route). 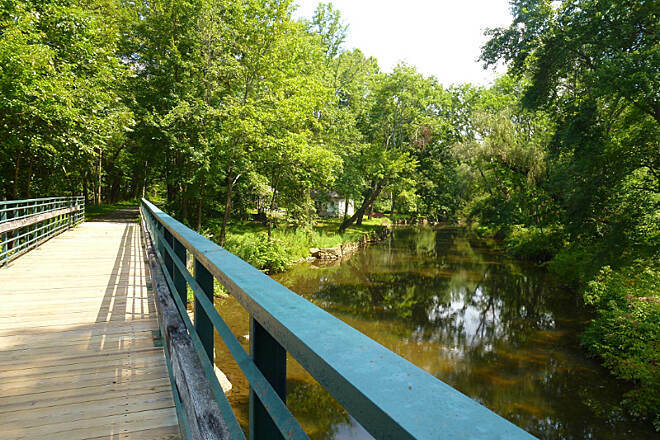 Scenery along the trail consists mostly of very heavily wooded areas, but I did pass by a few farms, quaint business districts in both Long Valley and Califon, and a quiet residential neighborhood in Tewksbury (there are very short on-street trail segments here and in Califon). 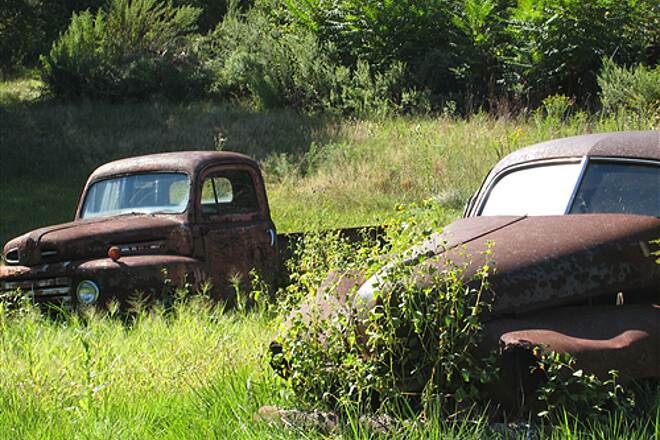 Oh yes, there were two junkyards along the way as well. 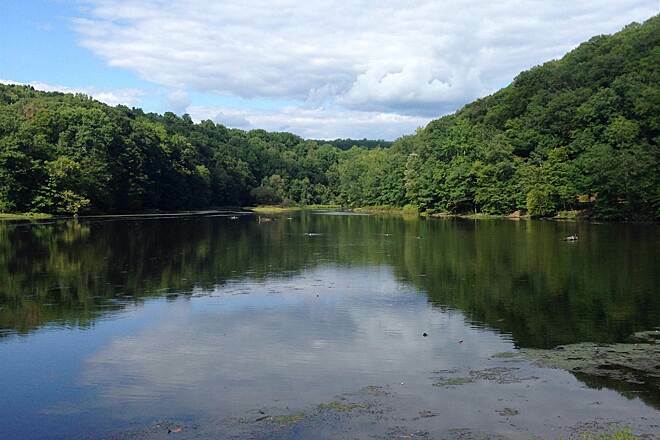 The most beautiful of trail views are located within the gorge area between Califon and High Bridge. The lures of this trail are most definitely its excellent surface conditions and routine right-of-way upkeep. 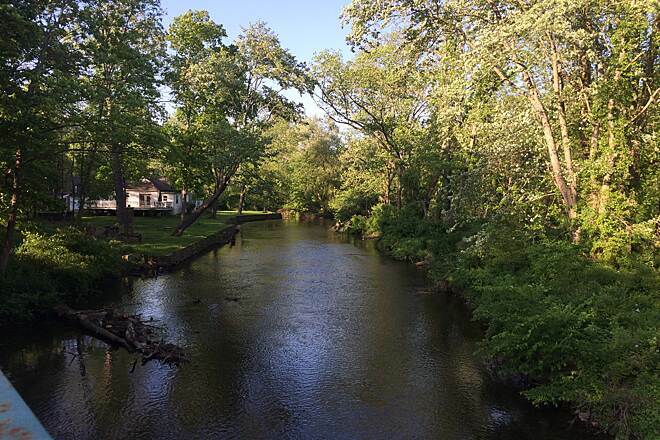 For those seeking a beautiful setting, I would highly recommend the nearby Delaware & Raritan Canal State Park Trail instead." " I returned to the Columbia Trail today. The bridge over the river in Ken Lockwood Gorge is now completely renovated. The river was full of anglers in hip boots, and the daffodils along the trail in High Bridge were almost at peak bloom. A local scout leader informed me that they were unable to plant new bulbs this past year because the donor did not supply any. But the reblooming existing bulbs are attractive, if not as dense as usual.
" 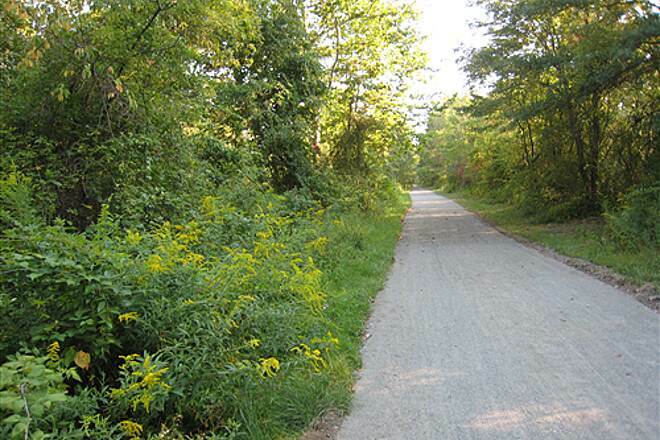 This trail is a continuation into Hunterdon County of Morris County's ever-present Patriots Path. 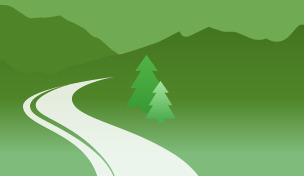 The path is generally good for walking and riding. 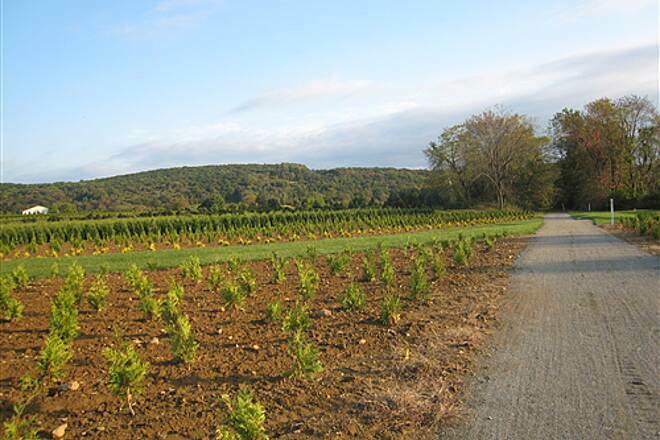 From Valley Brook Rd to Califon, the trail passes through farm lands and past rural-suburban homes. 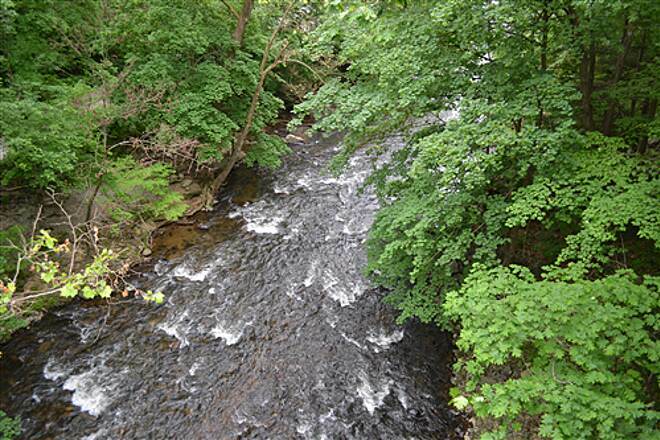 The next 1/3 of the trail goes from small town to river paradise, with the trail gradually becoming higher and higher above the South Branch of the Raritan River. Soon the trail enters Ken Lockwood Gorge, an extremely scenic and isolated area with cascades and rapids, and views galore. The trail crosses the river on a high trestle, which, as of my last trip, was not completely improved but passable. The views from the bridge and along the trail above and below the bridge are gorgeous. South of the bridge, the trail passes through a number of cuts and high fills, passing Lake Solitude (massive beds of daffodils bloom here every spring), and enters the town of High Bridge where it ends. This trail is well worth a visit at any time of year.